Monero is a software program run on servers across a large bandwidth of separate networks. The software is “shareware” as well as “freeware” as well as “open source”. And this adds a new dimension to software as a whole, the power of the “user community”. This community is what verifies new transaction against old ones, keeps all inputs and outputs in order with predictable operation results, and raises confidence levels among traders who either flip or HODL (hold on to) Monero (XMR). This means that the “current price of the coin” is only half relevant. This is because the “other half” is the general public using Monero XMR as a “digital middleman” to either finalize transactions directly or as a “in / out” currency for use in exchanges. Crypto coin market cap slides closer to fall below 100 billion USD. Blockchain technology. Say those two exact words to anyone and they will look at you very confused. We are all different, but we all are the same, and thus we have our own type of natural blockchain technology called a “collective unconscious”. As more people (individual users) start to use any form of blockchain, the overall value of the cryptocurrency attached to those blockchains should in turn rise. Example, Ethereum is a fairly new blockchain, but has improvements including a programming language, and also a crypto coin. And with that coin came thousands of new coins and I.C.O.’s (initial coin offerings). More coins are waiting to be invented, by us or by Artificial Intelligence. Each coin has a symbol and community and Monero is no different. With Monero being below my target price of $120 per coin, I feel a strong bull run coming by November 18, 2018. Price prediction by end of year is at least $176. 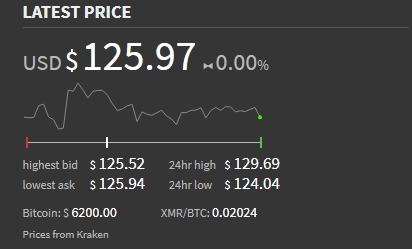 Price of Monero is UP today around $131. Bitcoin trades at around $6689. Updated release of Command Line Tools for Monero are released. This rise in price brought rise in network hashrate from around 380 Mh/sec to 480 Mh/sec, about 25% increase. 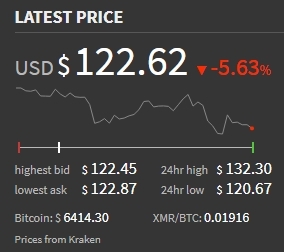 The price of Monero dropped to $122, but it seems to be falling/rising with bitcoin’s price. Summer begins 2018, June 21, and the price should be higher, possibly back to $200. What do you think? Now multiply that scenario times five running 24 hours a day all day all month and you can see why an electric bill can go from $150/month to $450/month. It has lots of ports and servers to choose from, so try it out and make some Monero. Monero as a commodity coin is now a thing. One of the developers, Fluffy Pony, wants to create a network on top of the monero network. Something other than gambling, well prospecting maybe. An exchange. Very interesting news. 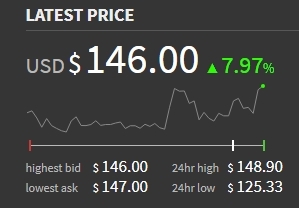 Other than that news, Monero has sustained a bear run and is holding strong above $159 USDT. Still hoping to be looking at a $224 July rally. Supposedly a fork occurred that would airdrop the new coin, MoneroV, to all Monero coin holders. 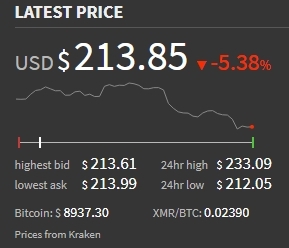 Hence, a sharp rise in price before the fork, but now a sharp drop to about $213 USDT. This price is comfortable, stable, and probably a safe “bottom”. If prices get below $200, signalling another “bear-run”, then be sure to HODL (hold your coins and don’t sell). Looking for a HOT summer price of $222 all summer long! What do you think? Leave a reply. Monero hits $280 USDT, But is it just tied to the upcoming MoneroV fork? 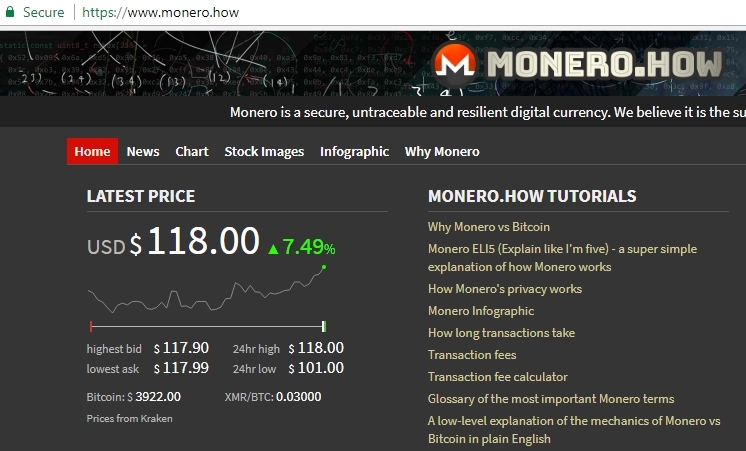 Use https://monero.how/ as a resource for up-to-date news and tools about Monero, including it’s price. Well it has been a bullish week (15 April to 22 April 2018) for Monero as the price shot up to over $280.80 USDT on 23 April 2018. Speculation of the future price may be HIGH due to an upcoming HARD FORK on or around 01 May 2018. Monero will remain Monero, however a newcomer, MoneroV, will be forking the blockchain and creating a completely new coin called MoneroV. Essentially the development team at MoneroV will clone the Monero blackchain, multiply the current supply by 10, and start a whole new coin in a whole new direction away from Monero. Sure, go ahead, have fun. They say, “Imitation is the sincerest form of flattery.” Well, that may be true in this case. Many people want your idea or want you to teach them how to do your idea, simply for the fact that they themselves cannot come up with the answer, but you can, you’ve been doing this for years now, you’re the top dog in this fight. So when the devs say, “OK, new update, new algorithm,…” New whatever WE ARE ON BOARD WITH MONERO. This coin plus Ethereum and Bitcoin and maybe Electroneum and Ripple, PivX and Dash and the list goes on, they are the coins to be copied and to be held to the best standards. That’s why everyone wants to be like them, but all they end up with is an ICO, a “lending platform”, a “referral link”, etc. If Monero hits a price like $325 on April 30, 2018, then after the hard fork I would not be surprised if many dump the coin and a correction in price back down to $220 area. Let’s wait and see. HODL, or hold, your monero. It is gaining momentum as the MoneroV hard fork nears in about 13 more days. 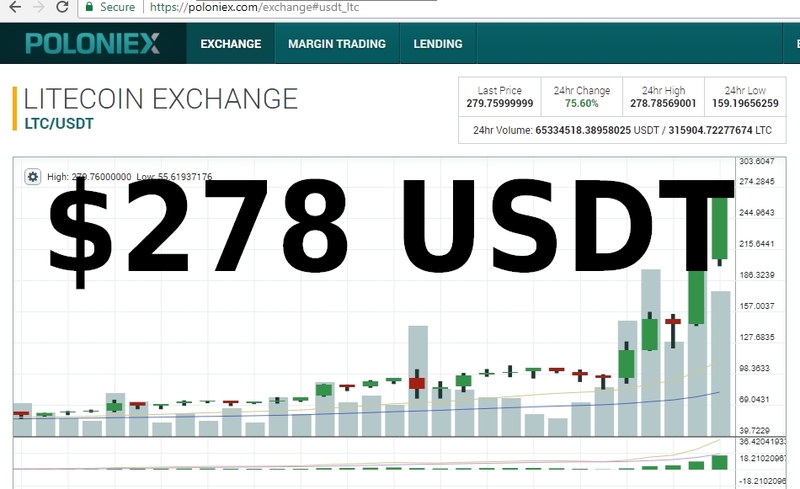 Price may climb steadily about $1 a day to about $244 USDT on Poloniex or other exchanges. Then some price speculators may exit the Monero (XMR) market (dump) and then also dump or HODL the MoneroV coins for a profit. 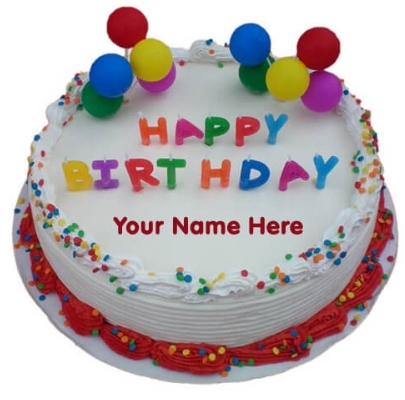 The cryptocurrency coin Monero turned four years old today. 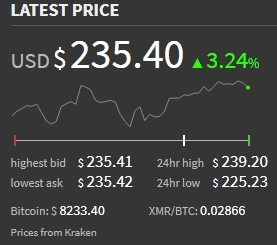 It’s price reached $233 USDT on some markets. Futures may look UP for Monero going into MAY 2018 as a new HARD FORK will occur causing a new coin to be created called MoneroV. Similar to what Monero Classic did after the Monero (v7) hard fork on April 6, 2018, MoneroV plans to multiply the current supply tenfold. So speculators may perform a small pump-and-dump of Monero leading up to and just after May 1st, 2018. My best guess is that Monero hits at least $244 maybe $265 before May 1, then back to $210 after that date. Just a guess, let us sit and watch the action unfold! The day after the hard fork, what now?? 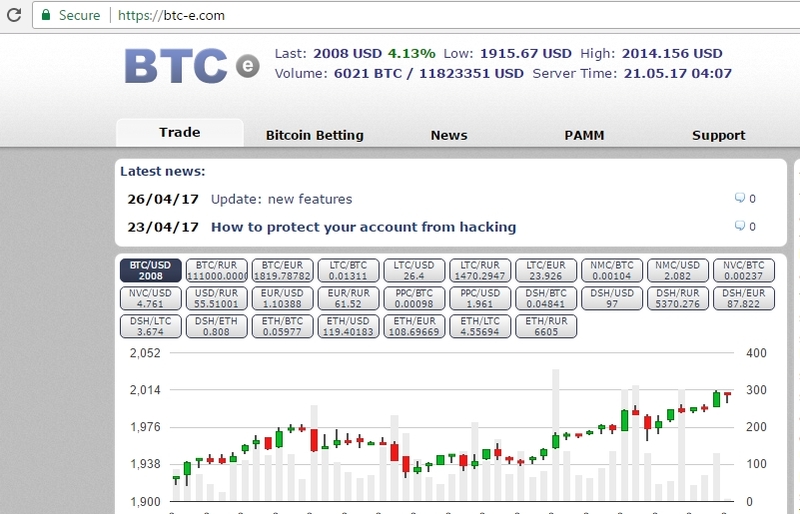 OK, so that tells me that either 800 to 900 Mh/sec which were active and valid before the fork are missing. What mining efforts comprised of those hashes? We must assume that at least 15 to 25% of the missing hash rate is simply CPU and GPU miners that have not correctly upgraded their mining software OR they are stuck with mining pools which are currently off-line or mining on the wrong blockchain. The other 75% would be a combination of BOTNETs and ASICs. WHEN WILL THE DIFFICULTY CHANGE? Difficulty on the network is changed every 720 blocks, so expect it to change on block height 1546719. It will drop dramatically to make up for these first five SLOW days of block mining. Now two days into the Monero (v7) fork and the network and difficulty are going down SIGNIFICANTLY!! This means you need to update your mining rig software and fire up those RX480′s and get back to mining! 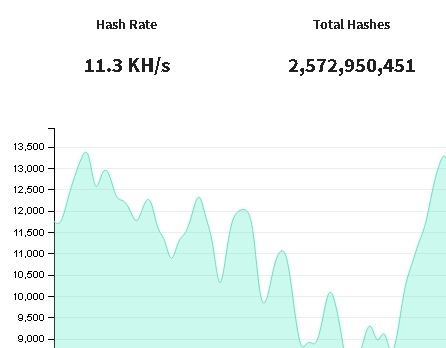 The value of your hash rate has gone UP! If you notice the difficulty today as well as the hash rate, compared to two days ago (day of the hard fork), you’ll see that there is an 80% drop in difficulty. This means that CPU and GPU mining is profitable, for now. It also means that ASIC’s are OFFLINE! Now upon us is Monero Blockchain Height: 1545999, and what comes next? Blockchain Height: 1546000 which triggers the new Proof-of-Work (PoW) algorithm required to solve a block reward. The difficulty is over 134 billion. Let’s see how far it drops tomorrow. At an average difficulty between 100 and 120 billion, how far will it drop starting tomorrow morning around 6:00 AM EST? This fork will change the algorithm used to mine monero. I can only predict that the difficulty will HALVE, thus gaining you more XMR for your mining rig (if it is updated). Good luck! Happy Spring 2018! 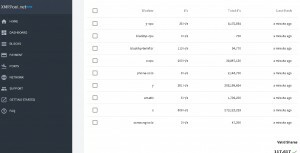 Try a Monero Mining effort made with DOCKER! 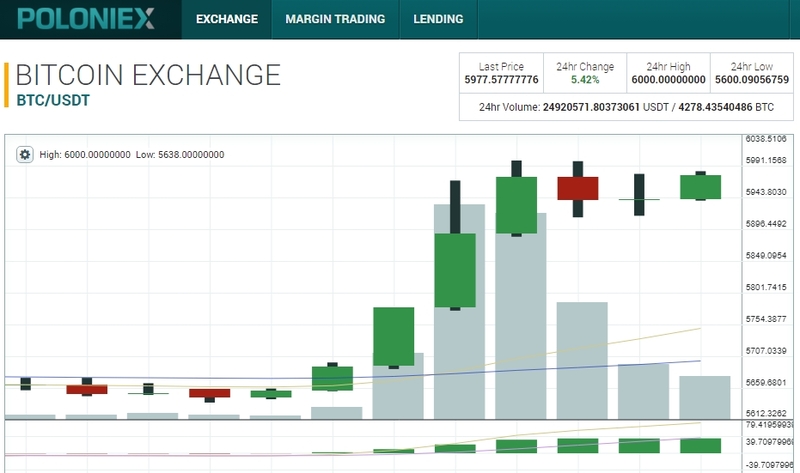 Admit it, you love to see the price of Monero go up and up and up all the way to the moon! 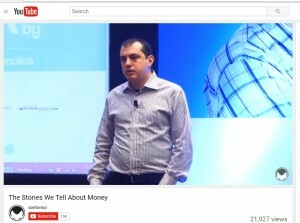 But reality sets in and the current market price is around $195.40 (according to https://monero.how/) I remember last year when Monero was introduced to BitThumb and the price skyrocketed from around $120 to $175 and things were popping back then. Then the USA had the hurricane storms and prices went back down, but then went back up for the Holiday season. Then Chinese New Year came around for 2018 and prices went back down, then went a little bit back up, but now back down. You know what all this means?? It means that these coins are being USED. It’s regardless of the price, because all I need is to transfer fiat to crypto for the amount I need in that scenario. Meaning, only use crypto at the time you need it, therefore you are not gaining or losing very much between the time you buy and finally sell. Miners however are feeling the “pinch” of newly announced ASICs which can mine cryptonote coins such as Monero and Electroneum. Monero devs are planning to alter the Proof-Of-Work to make these ASIC machines unable to mine Monero. One penny is worth about 100 satoshi right now, but tomorrow? One US penny ($0.01 USD) is worth around 100 satoshi. What’s a satoshi? 1 of 100,000,000 units inside one bitcoin. 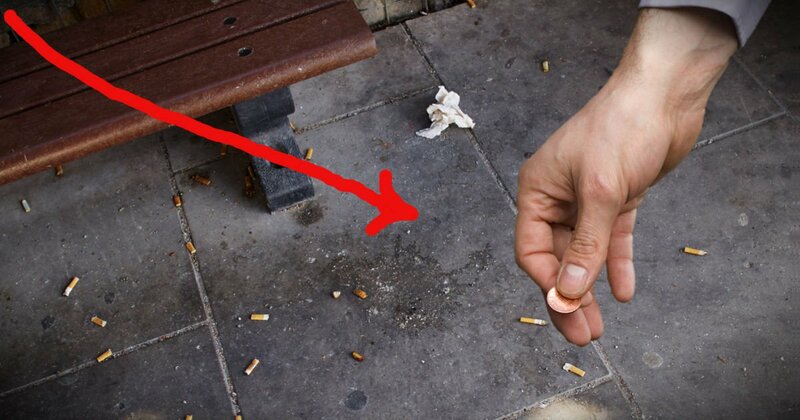 So when you see a penny on the ground pick it up, stash it, and when you have 1,000,000 pennies you can cash them in for one bitcoin. That’s if one bitcoin costs $10,000.00 By the time you collect all those pennies the price of one bitcoin may double to $20,000.00, making one penny only worth 50 satoshi. Do you see where I am going with this? What’s going to happen when one penny is only worth one satoshi? Do we tell the bitcoin people, “Hey, stop it with the high value over there!” When will it happen that you will need two or more pennies to add up to one satoshi? What will the future hold? ’99′Satoshi’ stores? I still pick up pennies only because I love to check the dates and find older ones that still have copper. 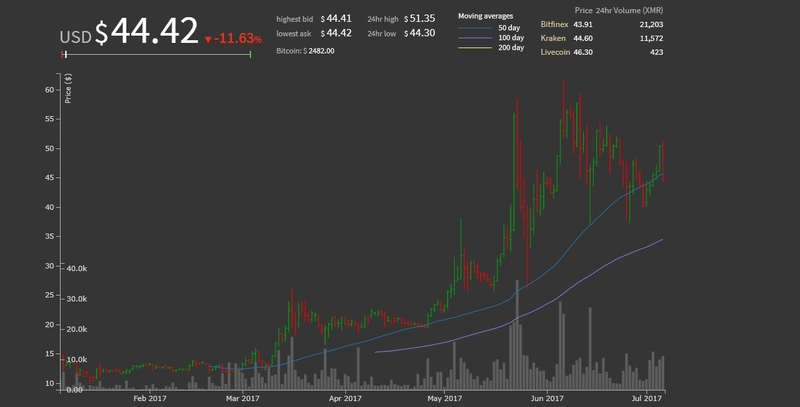 Recently the prices of both bitcoin, monero, dash, electroneum, and ethereum are all over the place, but rebounding on an upward swing. Also, miners are still working on finding blocks in Monero, Electroneum, Sumokoin, and newcomer KMcoin (cryptonote fork). In fact KMcoin is getting some traction as it is planning on adding a “masternodes” feature to their wallets. This would introduce masternodes to cryptonote and would essentially make it a proof-of-stake and a proof-of-work coin. A masternode is a node which runs the coin daemon software and mines for blocks, verifies transactions, allows other nodes to connect to it, etc. All this while keeping a minimum stake inside a wallet (for example 10,000 coins), in a combined effort this masternode will be given reward distributions skimmed off the top of every future block reward while keeping masternode status. The details above are suggestive and hypothetical and could easily be something totally different, it’s all up to the developers. Developing an eco-system is difficult when in the beginning there are no profits, no cash income at all. However, perseverance will win the day. Those who study crypto today will have absolutely no difficulty getting a career in this field by 2019. Welcome to block height 1515151, Also; Is Monero a SCAM? Sometime in the next hour the monero block height will reach 1515151. A milestone in my opinion. Current price is around $300 USD. If Monero is a scam, well let’s define “scam”. Is “scam” a “scheme strictly produced to generate profits”? If that is what a “scam” is then YES, Monero is a scam. It is intended to bring profits to the coin holders (HODL’ers) who want to invest today and cash out tomorrow (way-way in the future tomorrow, like in 4 years). They want Monero to REPLACE bitcoin and grow to over $15,000 so that they can cash-out and buy lamborghinis and go to parties on the moon. All that is great, but if Monero is a scam, then so was the Commodore 64. I have nothing against either but hear me out. Commodore64 was supposed to be the be-all, end-all in personal computing back in the 80′s. However, the home edition shipped with no CRT display, and no way of saving your work, you had to add-on a floppy disk drive or cassette loader. The makers of that piece of &*&& computer wanted to use technology and innovation to make a profit. They made a profit, but that ship soon sailed out to sea and they are no more. Perhaps that is what will happen to Monero, it will be deemed to unfriendly to the masses and be considered dead and unfun to use. Until that day comes the project will grow, hard-forks will incur and that is all good things for everyone involved, miners included. Also, chatter on the blogs say that when MoneroV is released, that you should not use Monero private keys to the MoneroV network as it may compromise you. 1,000 MH/SEC!!!!!! Difficulty up to 120 BILLION! This is great news in a down market. It indicates the will of the machines, not the will of the trader. Miners will always be responsible for maintaining the network and minting new blocks and fulfilling transactions with verified accuracy. Traders will buy/sell, rarely hold. They are the “tourists” in our crypto-verse. The recent downturn in the market has had PC Gamers excited in the hopes that GPU card prices would drop, even used cards. Nope, miners are back to work, making more coins, building new rigs, buying more hardware. GPU cards are for alt-coins, so a downturn in the price of bitcoin has no lasting effect. 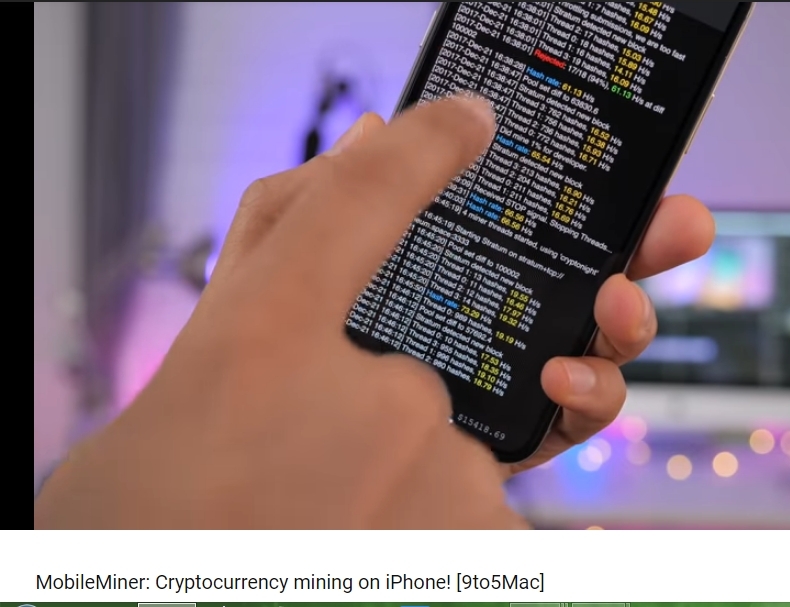 This video shows how to utilize your iphone’s cpu to mine cryptocurrency like Electroneum. Each additional hash per second on the network creates a chain reaction which eventually gets the network difficulty rating to rise. It has now risen to an all-time new high of 100 BILLION (100,000,000,000). This means if you are a solo-miner, with a hashrate of 1000 hashes per second, you could hit a block reward in about 1158 days. That’s if the difficulty remains constant, and if your hardware stays online. And that’s also only an average time frame, it could take longer, or sooner. This uptrend in Monero mining could be a result of Ethereum miners giving up mining Ethereum and switching over to Monero. Speculation, but eventually Ethereum wants to switch from Proof-of-Work to Proof-of-Stake. Whether the market is up, or down, miners want to get more coin(s), and the rising hashrates, the rising difficulties, the lack of cheap and available Graphics Cards, all point to a strong crypto-verse. Shitcoins are popping (pooping?) out everywhere you look. Look for keywords like “airdrop”, “fork”, “lite” and “cash”. 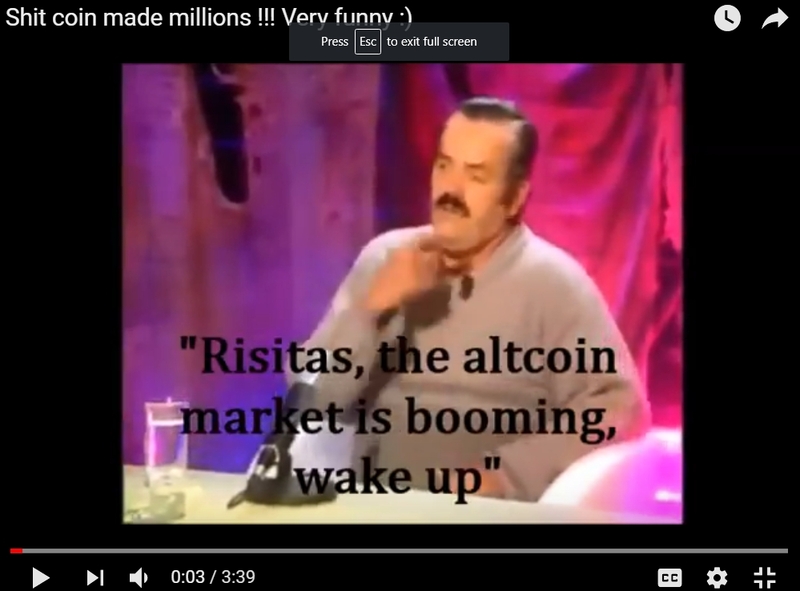 This video of course is satire, but is too funny to resist: https://www.youtube.com/watch?v=giGMA3fYFOM It talks about how coins and more coin and even more coins keep hitting the market, altcoins. It really is making Monero feel less and less of an “altcoin” and more like a “maincoin”. On the other hand, these are the “altcoins” I like; electroneum, storj, litecoin, ethereum, and of course monero. Have you seen this? A motherboard with 18 PCIe x1 and one PCIe x16 slots on board. Why the demand for this product? What are people doing with it?? Are they mining Bitcoin? Probably not, given that CPU and GPU mining for Bitcoin are futile efforts compared to ASICs. No, these motherboards are mining either Monero, Ethereum, or ZCash. Then afterwards, they may be trading it for Bitcoin, OR they may be providing hashrates to others in exchange for bitcoin. 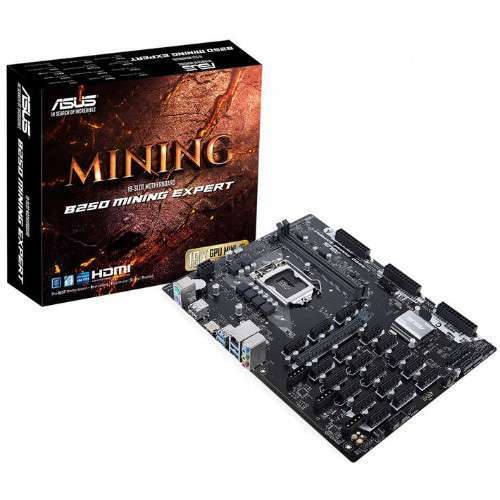 Either way, when a name like ASUS jumps on board with mining, its time to get serious about your mining efforts. 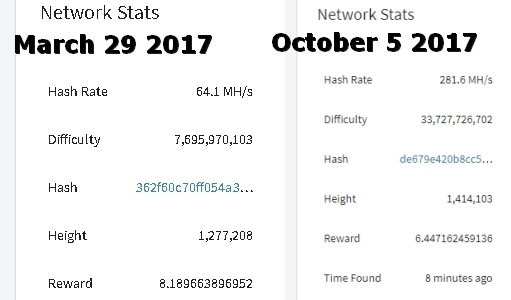 Monero Network showing highest hashrates ever! Demand for something indicates that it is valuable, scarce, and an item to hold, at least in the short term. For example, in Fall 2017 major hurricanes hit both Texas and Florida and caused a real and artificial demand for gasoline (petrol). In retrospect, the only true “demand” for gas was from people using it to leave the effected areas from wind and storm damage. However, since it was a “public frenzy” and everyone was having “fear of missing out” they decided to wait hours in lines to get gasoline. Afterwards, the storms passed, gas was plentiful, water went back up on the store shelves, and the casinos re-opened (in Florida). Demand for Monero is being shown today in the form of mining hashrate power. Monero can be purchased on an exchange for about 0.027 bitcoin, or about $315 USD. However, it can also be acquired by mining it. And the hashrate for mining monero has grown, causing the difficulty to find a block reward to grow, hence creating a stronger DEMAND for the coin. Get yours now for any upcoming storms and hold it, by the end of the year make that decision to sell, trade, or keep holding. You might be thinking, “why aren’t people just buying the coin?” It’s called a double-down. 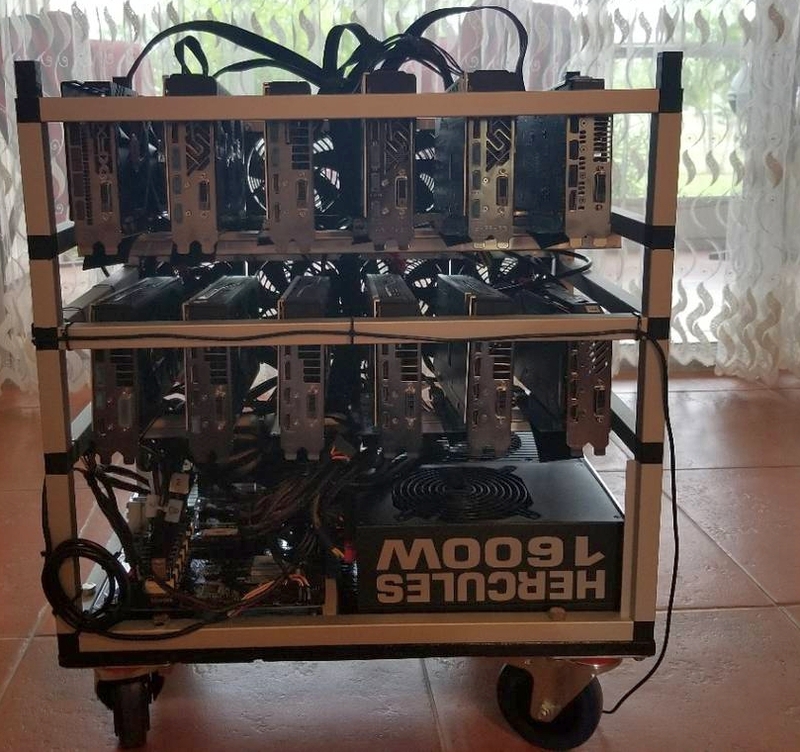 Miners are buying graphics cards, putting them to work getting cryptocoins, then cashing out the coins and reselling the cards, all at a profit. Buying coins usually results in having an account on an exchange, paying fees to trade and withdraw, leaving a trail. Miners can bypass all the obstacles of exchanges by mining coins, and either keeping them or trading them for other coins. 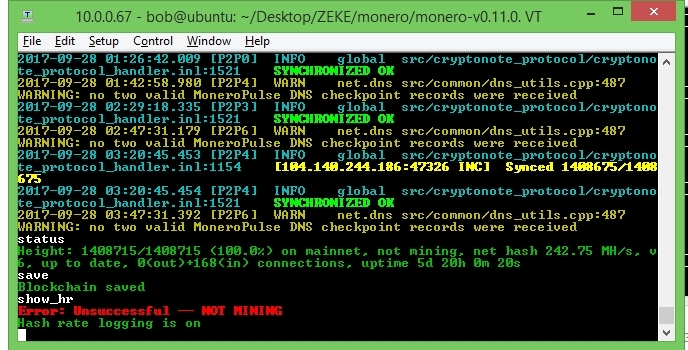 This screenshot image is from one mining rig that shows how the entire Monero network is over 675 MH/s, with a reward difficulty over 80 billion and coinbase reward below 5.5 XMR Monero coins. This video is a great primer on how to develop a CPU mining rig from scrap computer parts to make a 24-hour mining machine! Monero hashrate passes 600 megahashes per second, that’s over 600,000,000. The average hashrate for an MSI RX 480 reference card is 600 hashes per second. So, essentially, the network is running off of 1,000,000 RX480 graphics cards. Each mining effort is different, and many people, like myself, use CPU mining. Consider this; Electroneum has rougly 45% of the hashing power described above, and is currently only 15 cents! If you are new to cryptocurrency I highly recommend you mine your first few coins so that you get comfortable with the concept of mining inside a pool directly to your wallet address. It’s easy to buy and hold coins, but actually becoming part of the network that runs the coin, that’s the experience that will pay off in dividends from the residual environment, for example you could teach others how to mine, or build mining rigs. Yes, the network is strong in Monero. Everybody wants what everybody wants, and Nobody wants what nobody wants. Most happiest of new calendars for you and yours!! 2018!! The year of Anonymity? ?Monero is the king of privacy coins currently riding a market wave of around $400 USD. Electroneum (ETN) is reaching highs of $0.12. 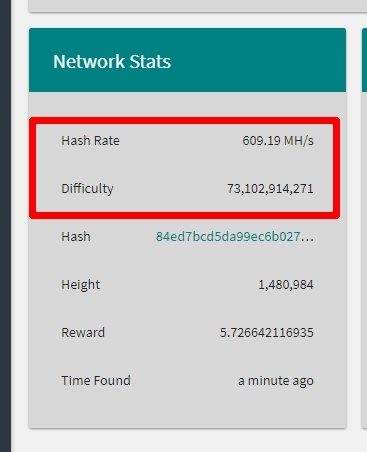 Difficulty on the network is rising due to rising hash rates. Recent price drops of graphics cards like the ASUS RX 560 at around $129.00 are bringing new hash rate efforts onto the network. This “demand” on the miner-side is indicative of a bull sign, where the price will soon go up. Expect a price of $450 by April Fool’s Day. 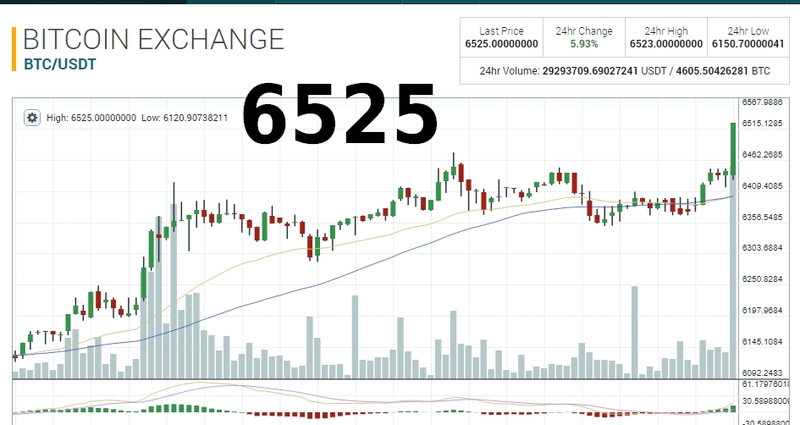 No, let me correct that future price prediction, make it $616.23! The difficulty of solving a Monero reward block is based solely on the amount of total network hashing power. 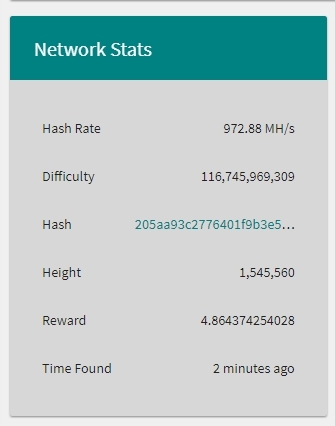 Today the network reached 500 MH/sec, paired with a 60 billion difficulty means that on average a reward should be found around every two minutes. The algorithm Monero uses, cryptonote, is currently ASIC-resistant. (application-specific integrated circuit) However that may change in the future as the price of Monero continues to rise. First Day of Winter 2017 brings BEAR-ish results – HIBERNATION? As of right now, 3:35AM EST 12/22/2017, the first day of winter, ALL TOP 100 coins listed at https://coinmarketcap.com/ have a negative 24 price ratio EXCEPT Tether and Electroneum. Hmm????? Will you hold or sell? Monero’s price chart over the last two months show impressive bullish behavior. What exactly is spurring this influx of money to both Litecoin and Monero? It may be that investors would rather hold 3 Litecoins or 3 Monero coins rather than 0.05 Bitcoin. It feels better to the investor when he can use whole numbers as a multiplier of wealth rather than using a calculator to determine the result. For that reason alone the new coin on the market Electroneum may be a good buy. For starters, it is a fork of Monero. Secondly, at present moment the price is about 10 cents. And lastly, the coin stops counting after the second decimal spot. So a bitcoin wallet balance can be 3.12381029, but an Electroneum wallet can’t be that value, it would stop at 3.12. This makes Electroneum an easy to use commodity capable of being traded with others for goods and services. What a day! And look how they end up in price! Monero is $309.24 and Litecoin is $309.33, nine cents more expensive. They do go hand-in-hand in the crypto-land. Remember when Monero and Litecoin carried a similar cost around $30 USDT? Well, now that they’ve both “matured” a bit, they both now share a similar price range around $275 USDT. This “pairing” goes well for both coins as they are becoming better investment vehicles against bitcoin’s current trading price around $17,000. What is obvious is that more mining power is being directed to Monero, but why? Have more investors come into the market? Are these GPU-card miners whom are hobbyist or geeks? Are they simply buying “mining contracts” from companies such as Genesis and NiceHash? What has made the network “jump” 30% in a week? Coincidentally the price went up about 30% percent. Hmm??? Makes you wonder that the “pep rally” mentality may be pulling people from the other-side (bitcoin,ethereum) over to the true privacy coin, Monero. If Electroneum is a fork of Monero and Electroneum is “good”, then that must make Monero “good” as well. I guess the forked coins are out there making a name for themselves while adding value to the Monero blockchain. Monero XMR pops $200 “bubble”? Monero is trading above $200, but is it a bubble? I would not call it a bubble, but a new HIGH. I hoped for a high price for the holiday season, just did not expect it to be this high. GENERIC BLOG ENTRY FOR MASS CONSUMPTION. BITCOIN IS NOW THE NEW DOWN PAYMENT ON A CONDO IN FT LAUDERDALE, FL. GET ON THE GRAVY TRAIN NOW WHILE YOUR KIDS ARE STILL IN DIAPERS. YOU’LL HAVE ENOUGH FOR COLLEGE AND THEN SOME. Green candlesticks on this chart! One day you will be able to make a house down payment with one bitcoin. You will then be contracted to send in a set amount of bit coin every month as your “mortgage payment”. All other payments that have to do with your house, like electric bills, water, trash, you will use Ethereum on smart contracts. Electroneum, litecoin, and monero will be useful for weekend get-togethers such as BBQ or picnic. That’s because in the future, grocery and liquor stores will be accepting some form of cryptocurrency for payment. Bitcoin up, Monero up, Litecoin up, Dash up, Ethereum up, Ethereum Classic up, Stellar Lumens up, seems like Santa was asked by half of society to bring them crypto for Christmas. So, is it time to pull back? Cash out some? Or are you doubling-down? Are you reinvesting Bitcoin back into Nicehash to mine more Electroneum ETN? If confused, just buy bitcoin and mine Bitcoin. Crypto investors are looking at Monero as a good “Hold” for 2018. As Bitcoin’s price raises above $8200, Monero sounds like a good deal at $155. Remember the 1990′s? USSR broke up, Clinton was elected and his VP invented the Interwebz. Oh what a time to learn HTML code. HTML knowledge allowed you to create “webpages” on the Interwebz. Hence, whoever knew HTML code got to the market first, even if it looked pretty basic and bland and generic and first-grade, I’m talking about you GEOCITIES. Nowadays the Cryptominer is the Webmaster. He can know how to assemble hardware with software to marry into a hashing computer. Enter EthOS. Provided by http://ethosdistro.com/ and https://gpushack.com (merchant store for equipment). The software marries eloquently with the hardware providing for bare-bones basic linux computing OS platforms pushing hashes through graphics cards. And the hashes it pushes are completely configurable to meet your desired result. For example, you can mine Ethereum, Bitcoin Gold, or even Monero. You can mine many more coins and setup the unit for remote stats and headless operation. The operating system costs $39 to download, but I found mine on eBay for $35 on 16GB SSD. Nice! Currently mining at 600 hashes per second using two HD 7850 AMD cards. 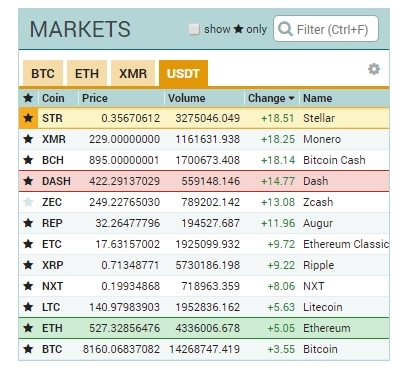 Monero XMR is no newcomer to this market value. It was trading at about $150 USDT just a few months ago when news was released that a new exchange would host Monero. This “slow-and-steady” growth approach is what makes Monero a good hold for future investment profits. Also, with the Electroneum (a fork of Monero) blockchain being released, Monero has grown in value as a result. Mining pools are like office lottery-pools. You join the office lottery pool by first placing money into a “hat”. That “hat” is converted to lottery tickets. If any of those tickets are winners, then those winnings are distributed among the participants according to how much money was individually placed in the “hat”. Solo mining would be the equivalent of buying your own lottery tickets and keeping the winnings, if any, to yourself. However, by joining with others in a “pool” you create a better chance of hitting a prize and being able to share those winnings. So the reason I switched mining pools from “xmrpool.net” to “monero.crypto-pool.fr” was due to the sheer difference in pool participation. 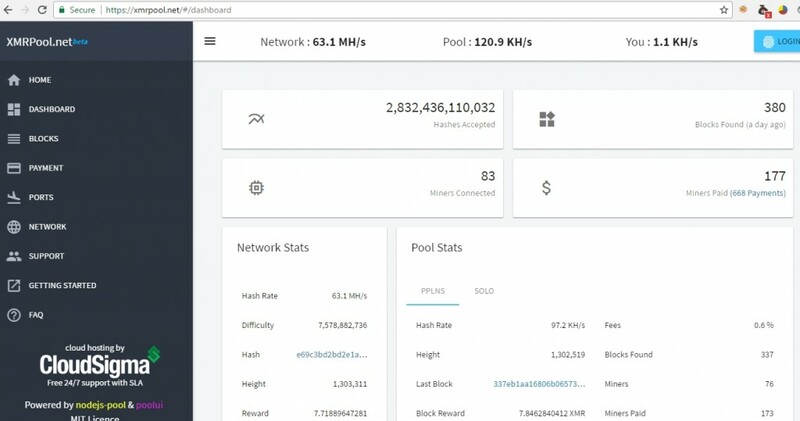 The first pool has an average of 500 KH/second dedicated to mining Monero, whereas the second pool has 25 MH/second, a difference of 50 times. The result is a more consistent expected weekly payout. Strength in numbers! 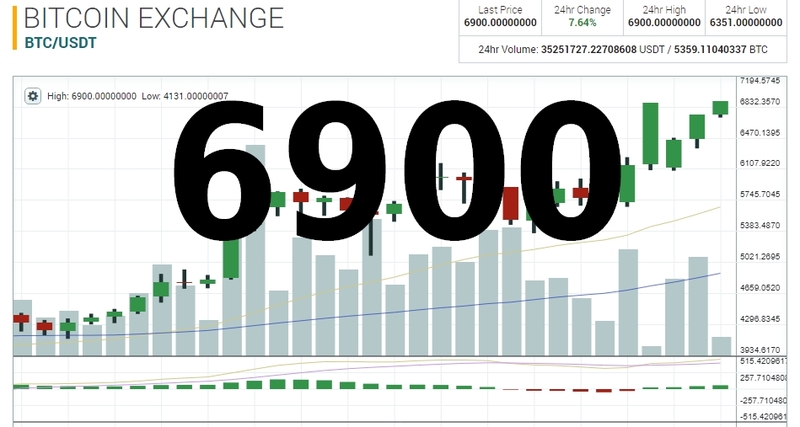 When will Monero have a market price of $8022? In reflection of bitcoin’s success of reaching 8000 USDT today on Poloniex, I wondered when in the future does one Monero XMR costs over $8K. Monero has a backing similar to bitcoin, but without all the fuss. We let the hairy llama talk for us and bring updates and new features to the platform. Next year, Monero should get to at least $500. Maybe in 2022? 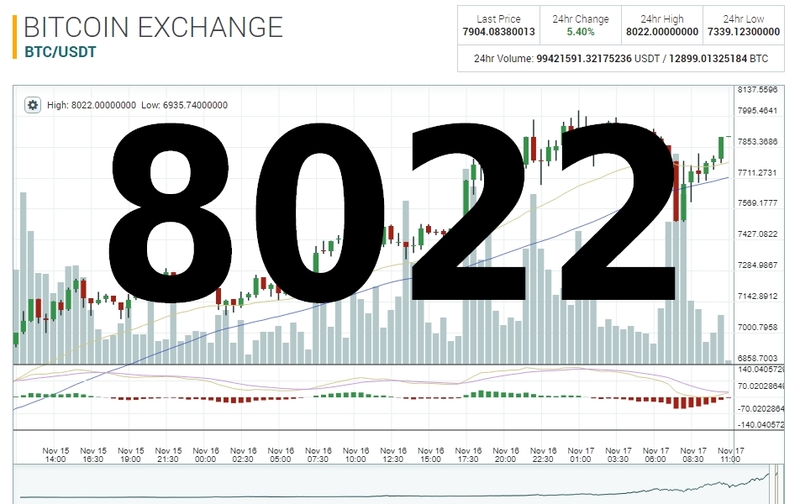 I will predict that Monero XMR will reach $8000 by April 2022. Let’s see what happens. Either Bitcoin is gaining value or my fiat currency is losing value, or both? 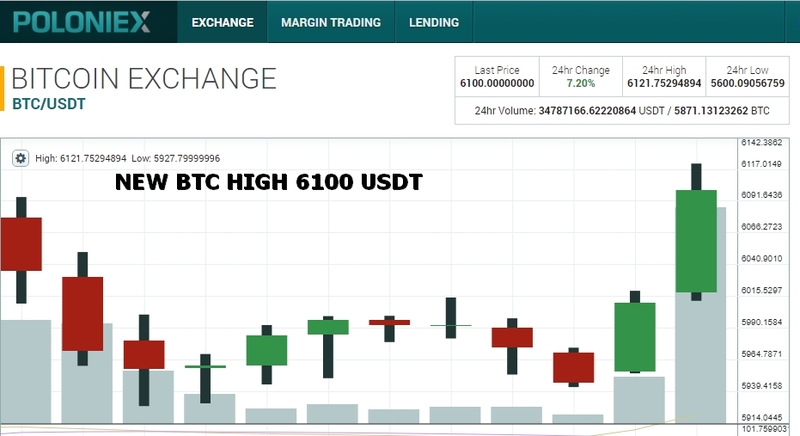 Bitcoin has come out a winner this day, almost pushing Bitcoin Cash below $1000.00 USDT. All crypto is in a frenzy, ALL CRYPTO. If you are into Ethereum, then your neighbor is into Dash. If you are into Monero, then your Aunt loves Electroneum. All this haphazard mess of coins is reminiscent of the “Dot-Com Bubble” of 2000. At that time I worked for a startup software company and kinda felt a change coming in the tech industry. In March 2000 I resigned from my post and soon after the bubbles starting popping. If you are not familiar with the infamous “2000 dot-com bubble”, basically hordes of investors double-downed on companies such as “Pets.com” just to make sure that they were included when Susie Borland in MA orders her cat food. It seemed to be the gravy train, but it was not. Soon after, lots of companies and websites folded. Get this, one company was called “Pay My Bills.com”. They even sent me a T-shirt for joining. Basically this company would receive all your bills, then they would open them, scan them to PDF format, and then email you the results. You would then give them authorization to debit your checking account to pay those bills via a check. What’s the catch? I don’t know, it was a free service and they never billed me. They went under. And like Feathercoin, most of these wanna-be coins are going to have a huge “coming-to-terms” with the amount of support and sheer numbers in their respective communities. 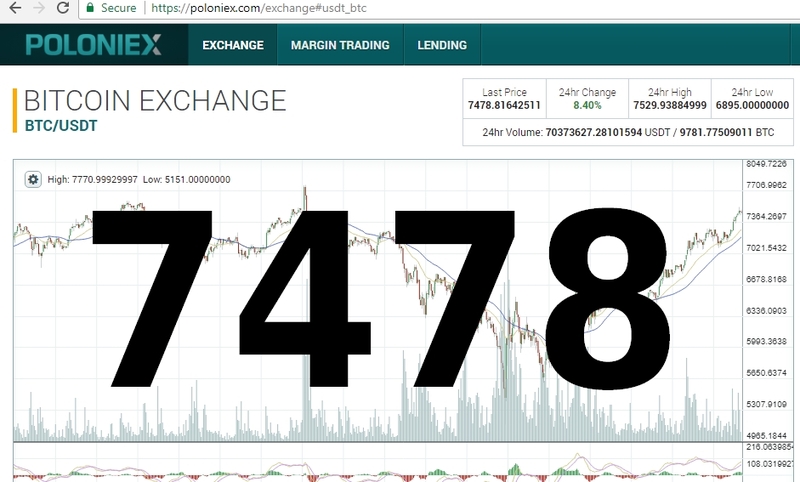 Bitcoin slapped everyone around today landing at $7478 USDT. Major coins on the upswing, except Bitcoin Cash! 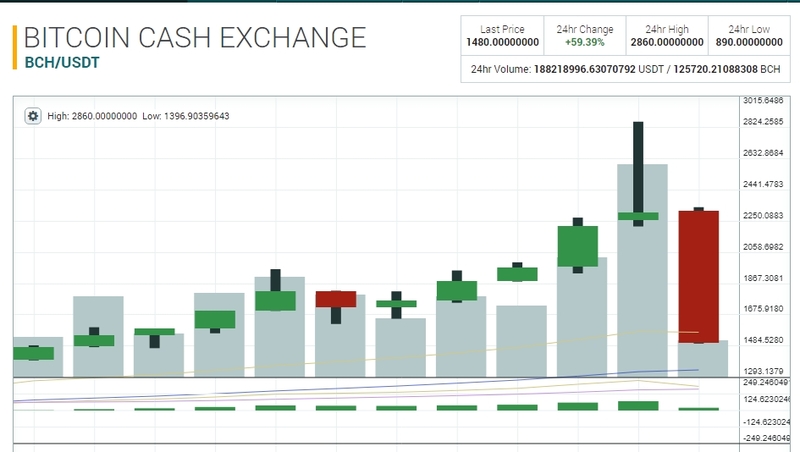 On this fall day I noticed on Poloniex exchange some major player coins on a positive upswing, all except for Bitcoin Cash. I watch the market for swings to see when is a good time to sell a little bit, in hopes to catch more coin when the price drops (if it drops). Recent big performers include Dash, Litecoin, and Monero. Monero, along with other coins like Dash, Litecoin, Bitcoin Cash, other top 10 currencies, have been getting a fresh flow of upswings lately. This may or may not have to do with the whole Bitcoin Segwit2X postponement. All-in-all, this gives Monero a strong bull-run going into the 2017 Holiday Season. Will you be asking Santa for a Monero coin this December? 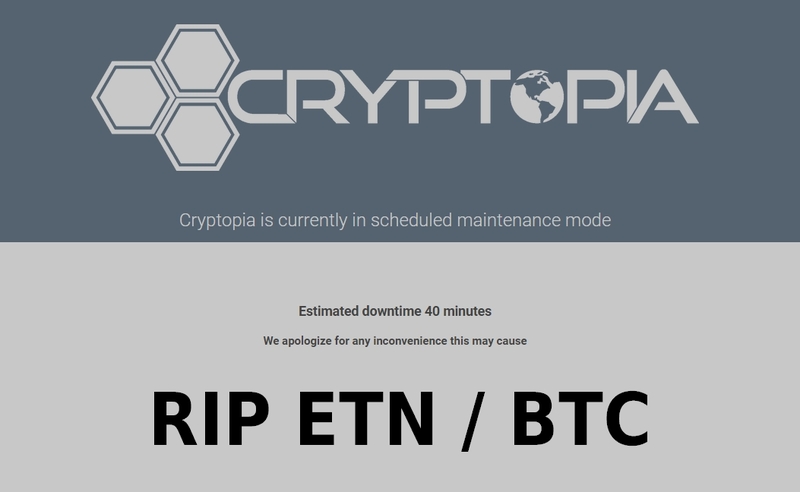 Say it is not so Cryptopia! 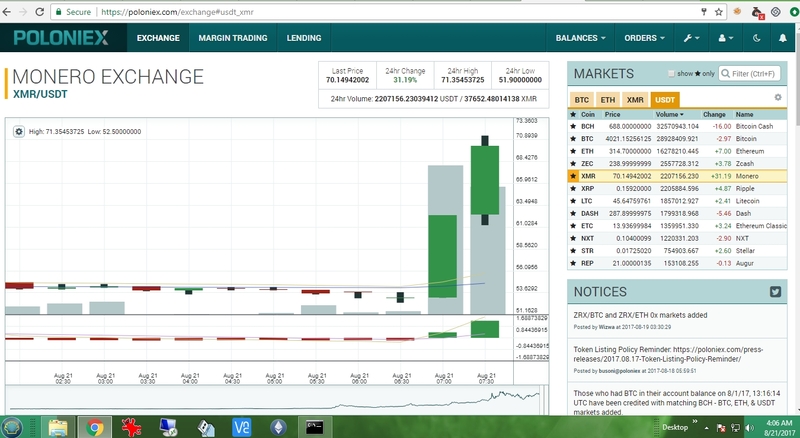 Not while ETN is on an upswing! Oh the humanity! Bring it back Cryptopia! Bring back Electroneum/Bitcoin trading now! Bitcoin Cash “cashes out” at $2800 to drop to $1400 in one hour – Pump and Dump? Bitcoin is going to revolutionize the world! You hear it all the time. It’s going to change the entire human race. I don’t know about that. When the human race is betting against each other on prices of coins, I think we are a ways off from “benefits for all”. 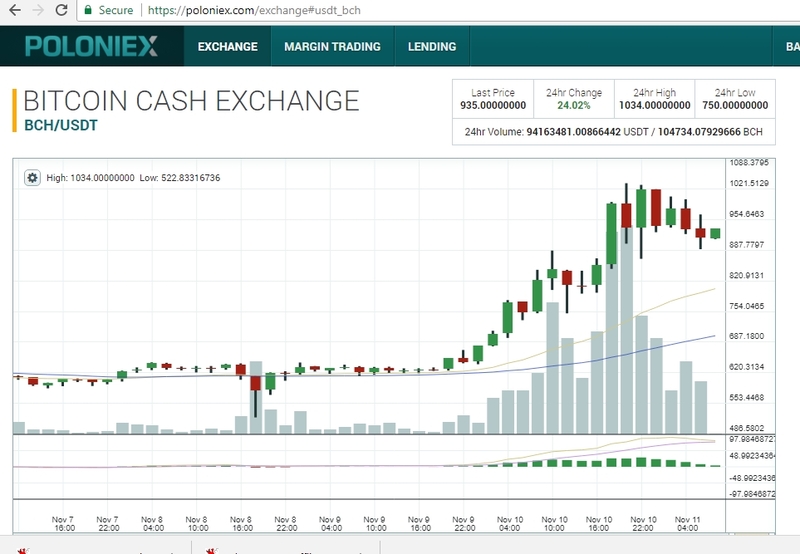 Today Bitcoin Cash, a forked coin from Bitcoin, hit $2800 on Poloniex, only to half that value in less than an hour. Wow! Is this a classic definition of a “pump and dump”? Is it just stop-limit orders being automatically processed by trading bots? If you are into this crypto market just for the profits, then this type of Pump-And-Dump is exactly what you were waiting for. Notice a rise in price on a coin, read about the news releases, invest in it, double your money, cash out. Seems like a great winning principle. Going in the opposite direction today was newcomer Electroneum (ETN). It dropped to just over 2 cents from a 5 cent start to the week. I think the mindset of those who bought into Electroneum’s ICO is to sell immediately. Problem is that they have not been able to access those coins yet. Release date is set for early next month. Next month is still three weeks away. By the time the coins are released the price may be below what they bought in at. At which point users will have to sell at a loss or hold until a future recovery, if there is a future recovery. Being a copycat coin is not easy, but it can work IF there is a community behind it. 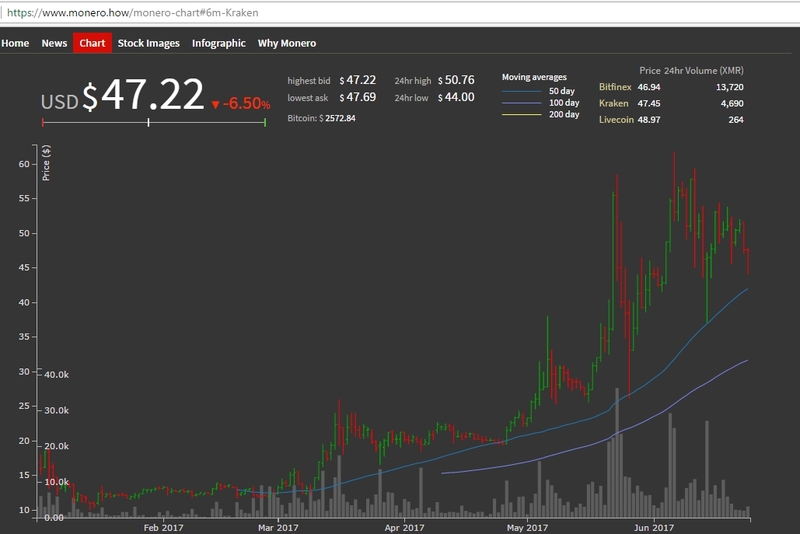 Electroneum can soon become the “litecoin” of Monero and reach $0.25 within a year. Keep that dream and when you wake up on November 12, 2018 check the price of ETN. In the cryptocurrency world we have seen prices fluctuate rapidly and so it seems that this “roller-coster” ride is just getting started. One month ago my trading partner said to me, “I bought one bitcoin cash for $360, I think it’s going to hit $1000.00.” I said, “I hope it does.” And today it hit $1000 and is trading at $940 currently. See in this new market all you need is a dream and the patience to HODL. Bitcoin’s anticipated hardfork on November 16, 2017 is not going to happen, or is it???? I think the “big wigs” of bitcoin came together and said “hey man, what if everyone falls in love with Segwit2X and moves over their miners and fiat currency to that coin and then they call that new coin ‘bitcoin’ and the original one dies, or becomes something like an alt-coin called Bitcoin Classic or Bitcoin Core or Bitcoin OG. Truth is bitcoin has already been forked earlier this year and as a result Bitcoin Cash emerged. Another “forked” coin to hit the market is Electroneum, ETN. It was forked off of Monero with an ICO (Initial Coin Offering) of close to $40 million. Here’s the catch, the ICO coins are locked in wallets that the buyers cannot have access to due to a “hack attempt”. Meanwhile, the daemon is released and the miners are off to the races switching their rigs’ config files or buying hashing power from Nicehash. As of now the coin still is trading at around $0.03. The tragedy of it all…. Where did the Monero network go? A drop of 20% in mining efforts had me wondering…..what is up? What is up indeed. Bitcoin is on an all-you-eat buffet binge getting to $7500! Monero staying afloat at around $85. However, what has me perplexed is the mining hash rate for Monero as a whole. It’s down, meaning not as many people/computers are mining this particular coin. Where did they go? Today I checked the Monero network hashrate to see it at around 200 MH/sec, when lately it has been around 250 – 265 MH/sec. Well, I had heard a little chatter about an ICO (*Initial coin offering) based off a Monero fork called Electroneum. One dev, Fluffy Pony, laughed that basically the coin copies Monero, adds more to circulation, based off cryptonote, spouts that it can mine off of mobile phones, etc. So, what have all the Monero miners been doing the last week? They jumped ship to Electroneum to gobble up those first 10000 blocks with the average reward at 7700 coins. I checked, right now as of 11/05/2017, one coin is worth about three us pennies, or $0.03. However, if you hit a reward block mining solo that;s about $200! With blocks hitting around the same frequency as Monero, quicker even. So this message is to you who flipped-flopped, GOOD FOR YOU, you are what makes the free market work. Now if my pool would just hit a reward already, its been five days! Now is the time to analyze both networks for their strengths. Bitcoin is digital gold and a standard in value whereas Monero has more privacy in remittance activities. Decentralization could also be argued as most Bitcoin miners are congregated in giant groups with advantages to low-cost electricity. Monero miners seem more dispersed. For example, a home-hobby miner might be utilizing 3-5 GPUs to maintain a hash rate of 1 to 4 KH/sec. Advanced/intermediate users could be those with a 10 to 25 KH/sec and a commercial use scenario could be anything over 30 KH/sec. SHA-256 is the algorithm used by the bitcoin network to solve the random chance block reward. Monero uses a different one called Cryptonote. 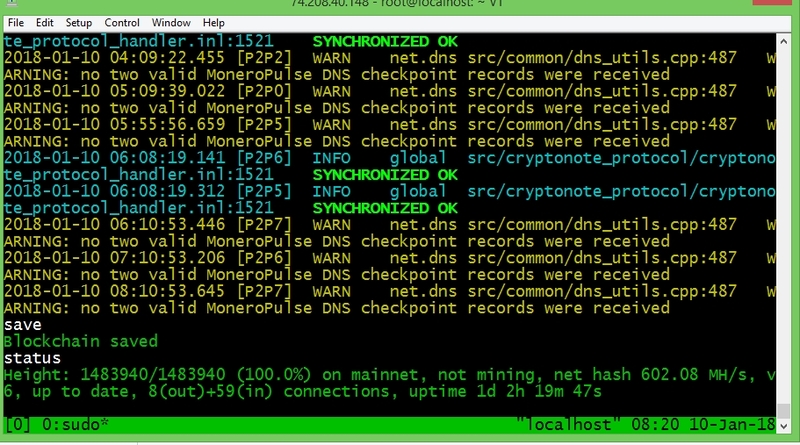 Cryptonote as of yet does not have an ASIC miner. An ASIC is an Application Specific Integrated Circuit which in layman terms means a machine that does only one thing. In 2013 a very popular USB ASIC hit the eBay market that allowed users to hash bitcoin at a rate of 333 MH/sec. Today ebay sells ASIC machines that offer not MH/sec, not GH/sec, but TH/sec, that’s Terrahash per second. That’s why mining altcoins with GPUs is a common starting point for new miners. Growth in ANY network shows support for that network whether or not the price goes anywhere. For example Bitcoin cost $250 just TWO YEARS AGO, today it is over $7000. Now is a good time to buy Monero. 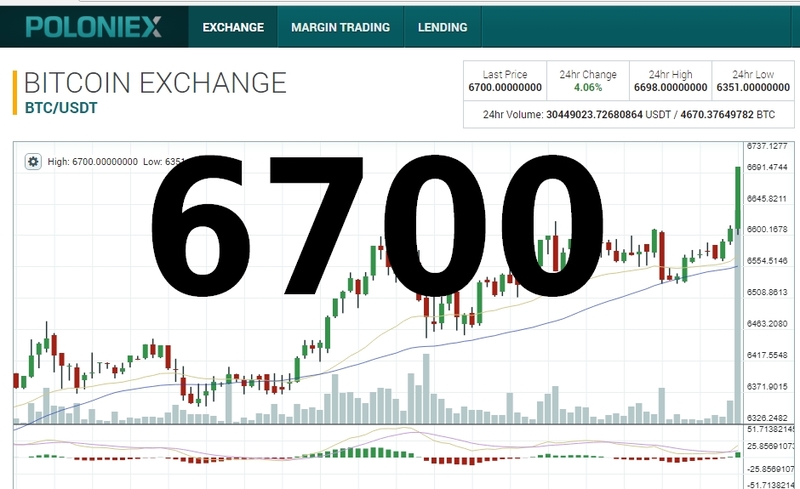 Bitcoin crosses $7000 market value, back to work miners! I see this morning that leader of ledgers bitcoin now has a market value above $7000. I keep asking “When will it drop?” Usually a peak of this magnitude sees a drop or correction, but the past few days bitcoin has sustained a strong bull market. Oh to be back in 2013 with a row of USB ASIC miners. The times of 2013 in crypto mimicked the times in 1995 with the internet. That would put today’s benchmark at par with the internet’s 1999 hype leading up to the “dot-com bubble” of 2000. While I don’t believe that bitcoin or monero can be called bubbles or balloons, I do feel that those who are holding bitcoin may be cashing in soon. And by saying “cashing in soon” I mean transferring bitcoin to alt-coins. Meanwhile miners are back to work mining coins using up electricity and equipment. Even if mining equipment distributors accepted bitcoin as payment, they themselves would need to transfer it back to fiat most likely to pay other expenses. Gravy Train – ALL ABOARD! What will stop the frenzy surrounding the upcoming Bitcoin fork? 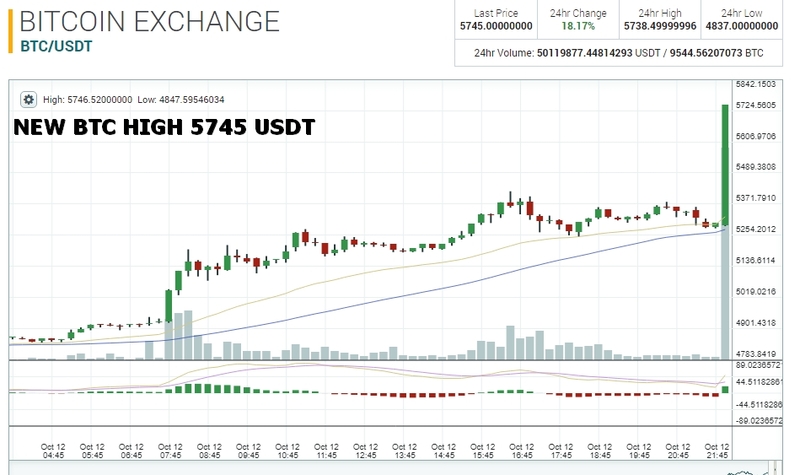 This “jump” brings a new high market value for Bitcoin, Monero stays afloat at 87 USDT. Everything will move to millibit (mBTC) and satoshi units in terms of pricing on everyday goods. If you are not familiar with those terms a satoshi is 1/100,000,000 of a bitcoin and a millibit is 1/1,000 of a bitcoin. So for example, you want to fill your car with fuel and each fill-up is 350,000 satoshi or 3.5 milibits, current day price of about $22. Forget the Dollar Store or the 99 cent store, imagine tomorrow you go to the dead mall in your town and see a 15000 satoshi store. Yes I can see it now with all those cheap knock off brands of toothpaste and towel paper. Merchants want cryptocurrency, they need enthusiasts like us to teach them how to create a wallet and start accepting cryptocurrency payments. In 1996 I owned a Packard Bell Windows 95 computer with a hard drive around 900 MB and a whopping 8 (YES EIGHT) MB of RAM. However I did also own a scanner and would frequently purchase band logo stickers at the now dead mall in my town and go home and scan them. One day I decided to build my favorite band an “unofficial band fan member” website using the scans and the little HTML coding I knew at that time. The website was successful in getting people interested in that band and on top of that, I used that website as a source work to land me a job at a software company. The moral of that story is that although cryptocurrency is new and not so well adopted, keep researching, keep learning, keep coding, and one day your investments will pay off handsomely. See how cheap our money has become? If you want to know the truth, only a very small percentage of our total circulation of money is in paper or coin form. Printing more notes may keep boats afloat but a better option is in crypto! Bitcoin bitcoin bitcoin. Like in the movie Groundhog’s Day, a repeating theme keeps occurring. Noise of “bitcoin, bitcoin, bitcoin” seems to be in a sound cycle where speculation is on some main topics like; future adoption of bitcoin, government continuity (how well cryptocurrency is adopted), and fluidity. My speculation is this: Bitcoin is king and will remain king for at least another year hitting $12,850 by June 25, 2018. Monero will be along for the ride as well but price predictions are fuzzy, hoping for $150-175 by next summer. Today bitcoin is trading at a new high of $6230 USDT. To the interwebz to get the latest lowdown on what coin is hot and which is not. 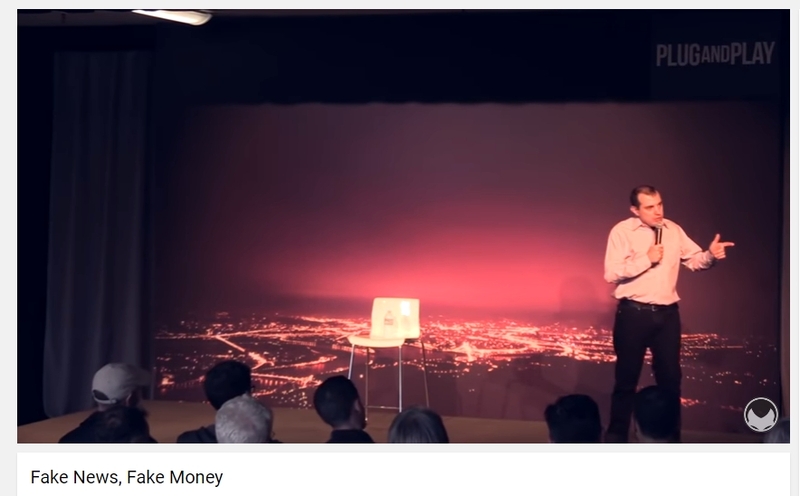 Click above to view a nice lecture on how to simple invest in crypto with $1000.00. Shop around, pick a winner, buy $500, hold for a week or two, buy the other $500. Divide it up in two or three coins. Pick ones you feel strong about. Don’t think that cheap coins are going to skyrocket overnight. Remember that Ripple (XRP) is NOT decentralized. Keep in mind actual tokens tied to physical assets, like STORJ which rents out hard drive space. If I could invest $1000 today I’d buy half Monero and half Bitcoin. They are the one-two punch! Get a fresh release of the daemon available now from GetMonero.Org’s download page link above. Very important if running a full node with an open 18080 port. 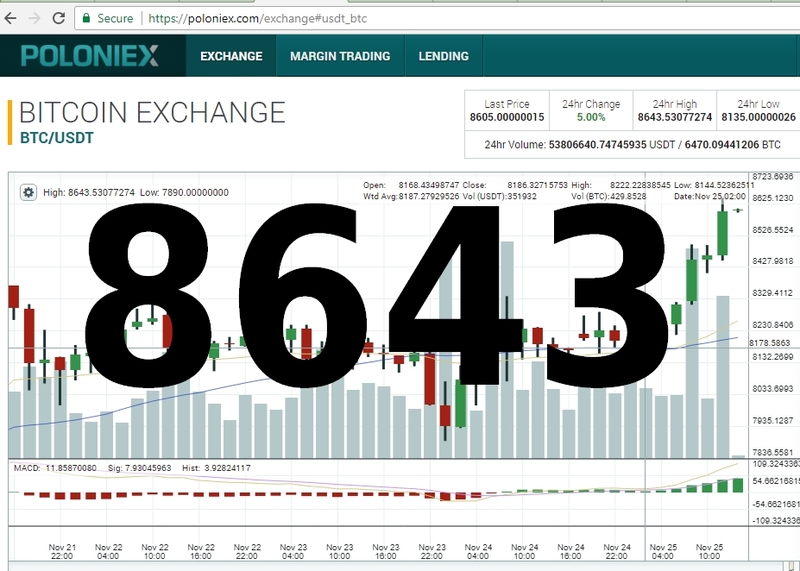 Price around $89 USDT on Poloniex. Coinbase / GDAX not to provide support for Bitcoin Gold, for now. Bitcoin Segwit2x has their OK.
Coinbase sent out an email earlier today stating it would not support Bitcoin Gold, for now. Stating that if the software for the coin is proven stable that it may incorporate it. On November 16th, 2017 a bitcoin fork will occur creating a separate blockchain with a separate “coin” called Bitcoin Segwit2x, Segwit2x, B2X, or simply “Bitcoin2x”. Futures market as of today have one Bitcoin2x coin at around $950 USD. This means that if you have one bitcoin in your wallet on Coinbase, then after the fork you will have your original one bitcoin plus one bitcoin segwit2x coin. Who cares about Bitcoin and all its forks? I thought this site was about Monero XMR! Would you discount a gold coin? Probably not. Gold has inherent value. Bitcoin has inherent value because it is the current industry standard as a placeholder of secured value. In fact, most Monero purchases are made with Bitcoin, so if you have an interest in Monero you best have an interest in Bitcoin or Ethereum or Litecoin, for those coins are highly traded against Monero. Monero has not budged from mid $80′s to a high of $92 for the last few weeks. This is right in line with where Monero should be as a steady incline of value is added each month. By next summer Monero should be at a constant of at least $130 to $160, in my opinion. Support for Monero has not dropped, mining rates are at a constant 250 MH/sec., difficulty tops out around 33 billion, nodes are around 1000 worldwide, but the block reward is getting closer and closer to below 6 coins. By 2022, the reward will be down to below half of one Monero coin. Waves and bubbles remind me of a surfside beach, where high tides and low tides are commonplace and expected. 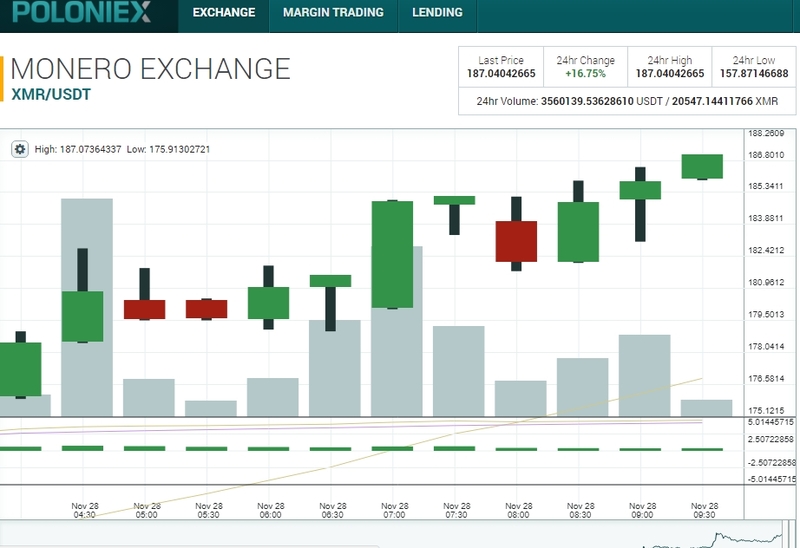 The Bitcoin bull run to above 6100 USDT on Poloniex.com can be attributed to the upcoming fork(s). Investors who were able to “hold” BTC and get Bitcoin Cash as a result of the last fork want those same dividends again. My opinion is that the current price includes the prices of any forked coins. Price may hit $7500 to $8100 by the end of year or drop back to mid $4K after all forks and forked coins are settled. Bitcoin is an asset that keeps re-inventing itself. Monero XMR is struggling to keep above $90, but has really fared well these past two weeks, keeping a steady price. Consistency in this market is a true sign of resilience. CRAZY BULL MARKET as news of hard fork has speculators doubling-down on their bitcoin wallets hoping to cash out even more after Segwit2 adoption which may cause a split at exchanges giving holders of bitcoin the next forked coin as well. Rumors of the bitcoin we know know to be known as BT1 and the new forked version as BT2. Keep holding on and try not to fall off this roller coaster ride. 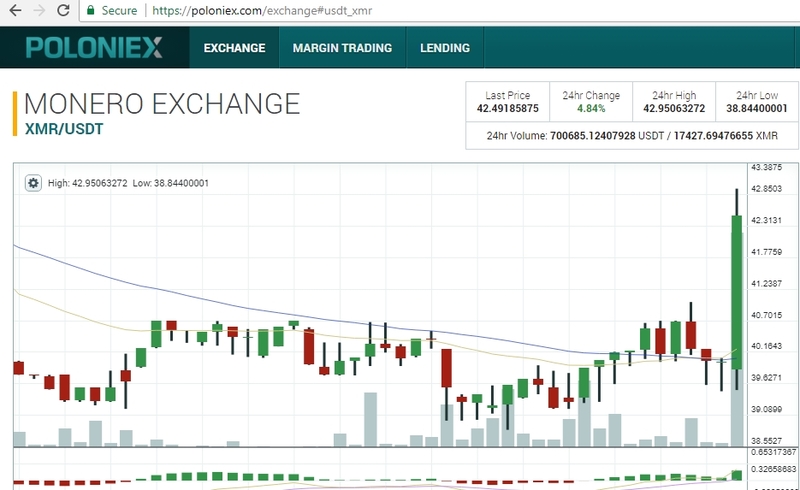 Monero fairing well at $85 USD, now may be a good time to buy more Monero XMR coin. If Monero hits 0.015 BTC then I plan to pick up a few Monero XMR coins for a rainy day. We hear it all the time, “It’s too late to get into bitcoin now, I’ve missed that train.” Have you really? This type of talk reminds me of those in 2014 and 2015 discouraged about the low price of bitcoin at that time and the costs involved in mining. The posts I remember reading would say something to the effect of “you’ll never make your investment back, not with the difficulty always rising.” However, what they failed to incorporate in their statements was the fact that IF the price of bitcoin were to go up then miners would be able to make back their money on their investment and then some. Fact is that is will not be “too late” to get into bitcoin or monero or litecoin or any other coin since we have not even hit ten years into this new world of cryptocurrency. For example, I bet you probably don’t still write out checks to certain companies, you pay either online or over the phone. You probably don’t send letters in the mail using postage, choosing to use more efficient ways like email or social media messages. 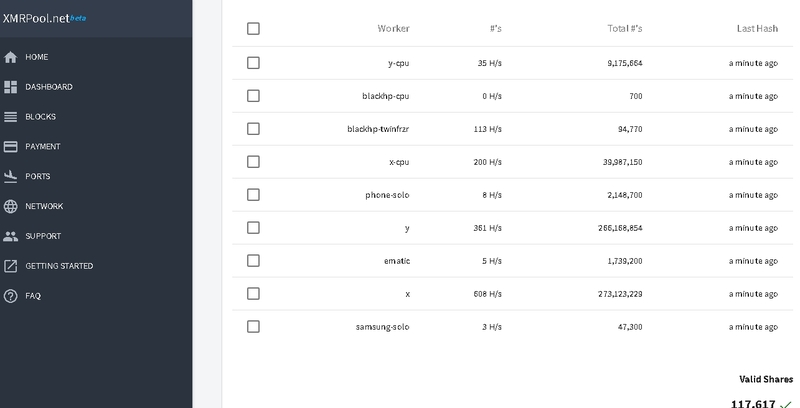 At my workplace, we can check and modify schedules using a web-based app. Once you start to understand that bitcoin is not going away you will start to learn that buying now to hold for later will more than often net you a positive gain. Price of bitcoin today is $4800. All this computing power will cost about $1.75 per day in electricity but should still net at least $1 profit using today’s market price and network difficulty. When shopping around for graphics cards turns up empty on the budget side, look to Craigslist or eBay (using Local pickup) to find a great deal on old server hardware. On the capital expenditure side the price is lower than GPU cards only. On the operating expenditure side however is where a good electricity rate comes in handy. If only I could still have my old job at a storage unit facility where some units were equipped with electrical outlets. I could “rent” one using an alias, store all the computer hardware in there, turn it on, connect over wi-fi, and “viola” the unit pays for itself every month and then some. If you live in a rental where “electricity is included” with an all-bills-paid plan, then this route would definitely be for you. You could pack as many servers as possible in the coolest room in the house (usually the bedroom) and then end up sleeping on the couch. Hey, all for the Monero! We’ll all retire by 2023! Mining difficulty has increased over 400% since March of this year. I see this new record high in mining difficulty as a direct result of all Monero XMR has to offer. This includes renewed interest in privacy coins, also the lack of cryptonote ASICs. 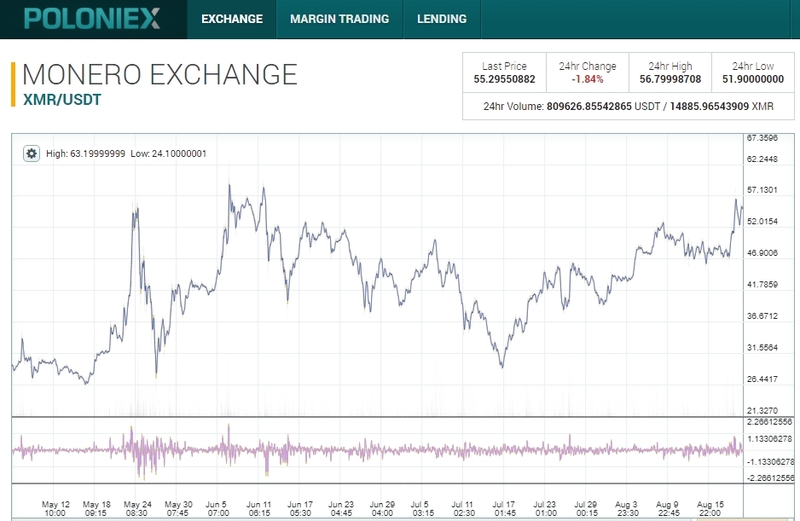 Price of Monero XMR is keeping a support level of $90 USDT on Poloniex and bitcoin is keeping above $4K. Happy October! 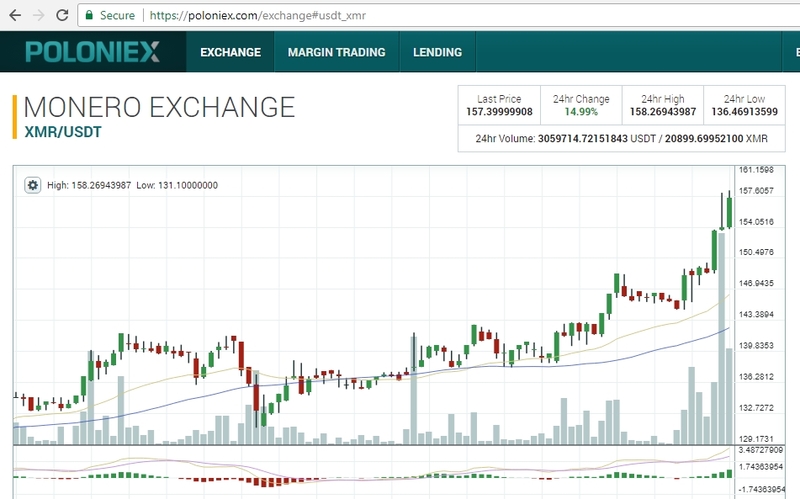 The cryptocurrency Monero (XMR) is now above $100 USD! And so as the price rises, more interest in the coin is generated. For security reasons most persons will download the daemon software, run it in their native computing environment, then wait for it to become fully synchronized. From that point you can safely open the wallet software program to either create a new wallet or open an existing one. Tools exist also to allow users to retrieve their original wallet from a word seed list or private keys. The blockchain is large (above 20 GB) and can take one or more days to sync if you are starting from scratch. 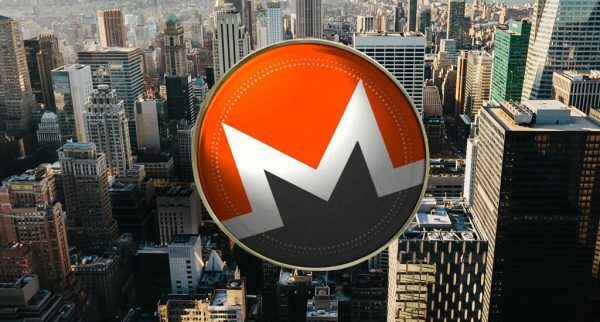 If you have been following the recent successes of Monero XMR, as well as the bad news, you may have wondered why the price of Monero XMR is down currently in the market. By my opinion only, I think this is exactly where Monero should be at the moment. Today may be a good time to sell if you feel the price may drop to mid-$70 USD, only to rebuy at a lower price. I hope to see this price average through the remainder of 2017. In the news are the rumors of China banning private cryptocurrency coins like Monero, PivX, DASH. But from what I have read China is banning ICOs (Initial Coin Offerings). I bought into an ICO with Storjcoin. The price of STORJ today is the same as when I bought into the ICO, less even. So I can understand a country wanting to safeguard their citizens from being cheated out of their money. Some of these ICO’s look like systems to build and sell more ICO’s. When North Korea converts all their money to Art-coin, be afraid. As soon as the last post hit the interwebz, bam, prices all around started to “fall” in a bear market. The following day prices rebound a bit but then fall again. 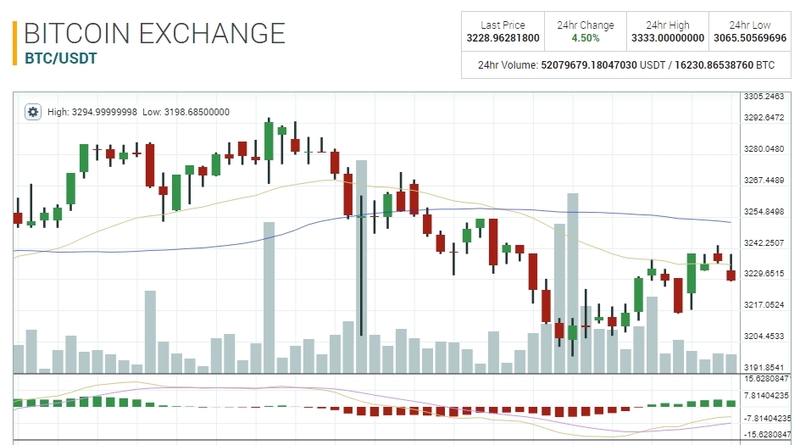 With Monero XMR trading currently at $90 USD, Bitcoin is down as well to $3500. Bitcoin actually dropped to below $3000 USD at one point Friday September 15, 2017. But considering where all these coins were just five months ago, they are still in a major uptrend and these price corrections are a healthy sign of where miners meet buyers. 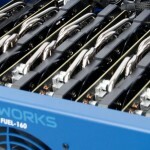 Miners do ALL the work, they keep the network up and running, and essentially play a lottery to capture the next block reward from the coinbase. Along with the block rewards are the fees collected with each transaction. These help miner’s keep a profit. After hardware costs, electricity costs, pool fees, etc., running a 1000 hash per second rig for one day will get you about $2 USD worth of Monero, but cost about $1 in the process. Buyers of Monero on the other hand have a direct need for the coin. Investors, day traders, rainy-day collection fundraisers, everyone has a so-called “need” for Monero XMR now and predictably in the future. It is that “need” which then turns into “demand”, and if the “supply” is available, then a fungible market will exist. So as “buyers” may see falling prices as troublesome, “miners” are still mining. Mine some Monero XMR today! I recommend using an MSI AMD RADEON RX480 reference graphics card, 4GB. It will get you about 500-600 hashes per second. A great starter graphics card if you are interested in becoming a crypto-miner. Below is a screenshot of the card in action. 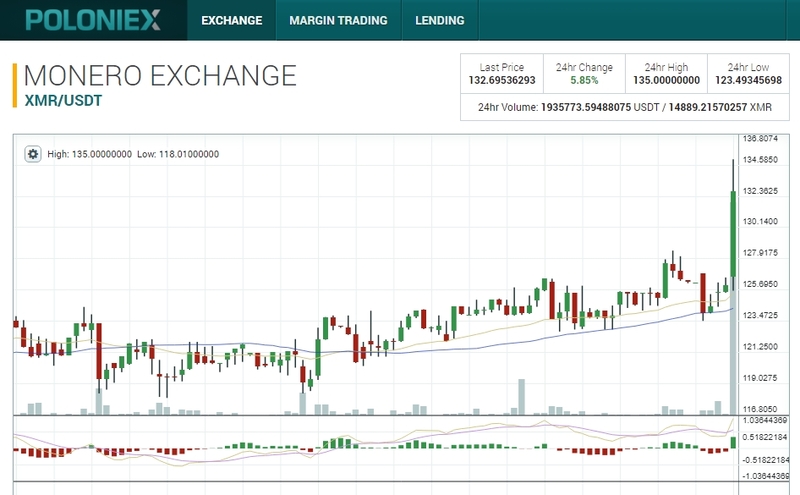 As the hard fork nears, about two more days from the time of this post, the price of Monero XMR continues to keep a support level above $110 USD. Eclipse, hurricane, flooding, fires, mosquitoes, bad weather and calamities. These items and a bull market (a rising prices market) seem to go hand-and-hand. Now add hurricane (IRMA) which may hit the US eastern coastline sometime next Saturday as a possible route and you have a perfect mix of a rush to cryptcoins like Monero, Bitcoin, and Litecoin. Litecoin has hit a price of above $80 recently. Monero steady at around $128 and Bitcoin at $4515. 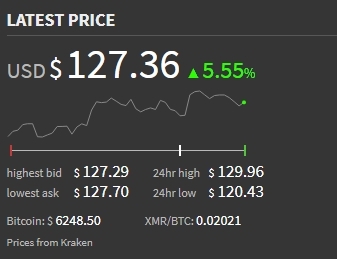 Monero XMR is at an all time high of $146 USD. What will the price trend show during the Labor Day holiday? For some reason I have noticed a correlation of bad weather to price changes. Rain, eclipse, flood. I’m worried when an earthquake hits, the price will go to $275 inside a day. This price may correct to $105, but as long as Houston, Texas is under water the price will remain around $150. 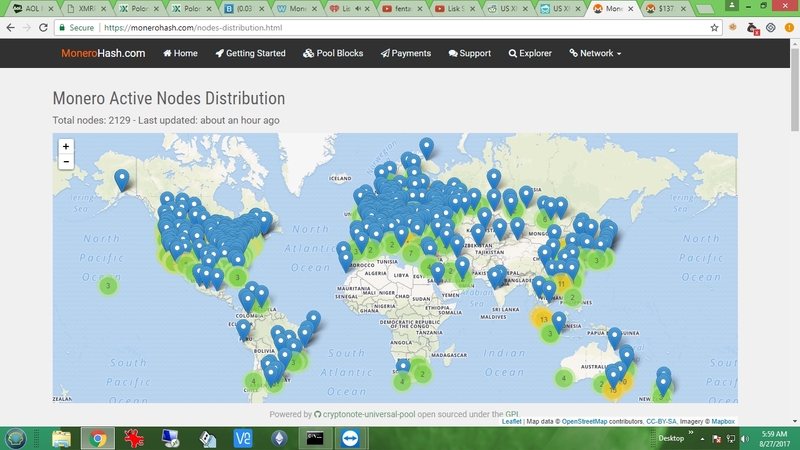 Over 2000 full nodes running the Monero network! A new record high. These nodes are running on open ports, taking up over 20 GB of data in total blockchain file size and daily network transfer (upload/download), and above all create a stronger intrinsic value within Monero. This number is an answer to the price rising above $125 USD, among the “chatter” of Monero XMR news of a new outlet for purchase, an exchange. I and my trading partner feel $125 USD is too high right now and the price may shorten to the mid $80 to $100 USD range between now and Labor Day. Even if Monero XMR is $70 on December 1, 2017, I will still be under the impression that it is on its slow upwards course. What happened to make the price jump? An eclipse? Rumors abound that the “great american eclipse of 2017″ is actually the dawn of the F.U.D. (fear-uncertainty-doubt). Everyone is giving up the petro-dollar for the blockchain-dollar. People will be graduating with degrees in cryptography and then be able to “name their own salary” as my trading partner described over lunch. Price is jumping up, but will it copy-cat other coins such as Ethereum or Dash? 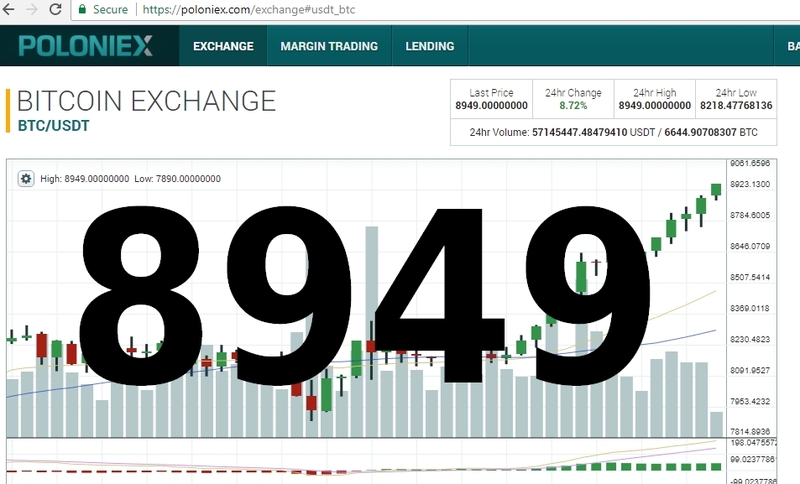 A new all-time high of highs was achieved as the price of one bitcoin listed on Poloniex at $3333 USDT (United States Dollar Tether). 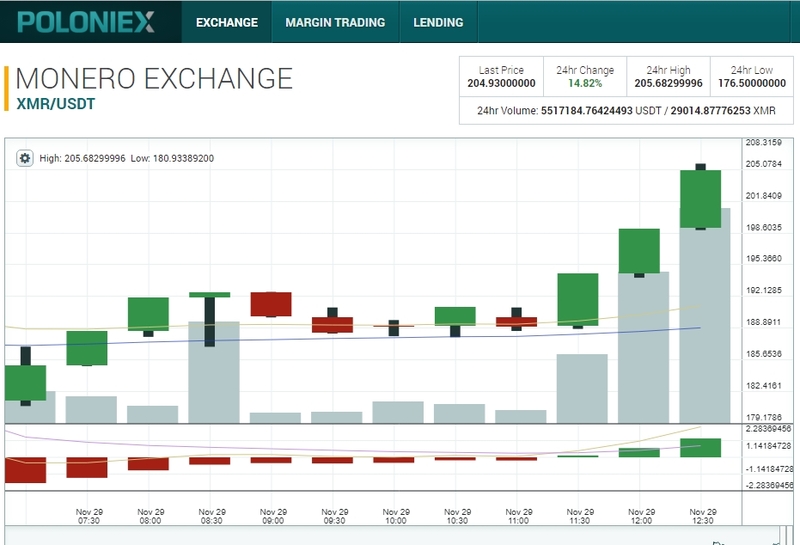 This in turn caused a rise in Monero XMR to over $48 USD. With Christmas Holidays within a 4 month stretch, I can hope that the price of Monero XMR will continue to rise at a rate of $8 per month to land at or around $73 USD by the end of this calendar year, 2017. One can hope, but even if it drops back to $13, I will still continue to mine and tell others that Monero is a good bet. 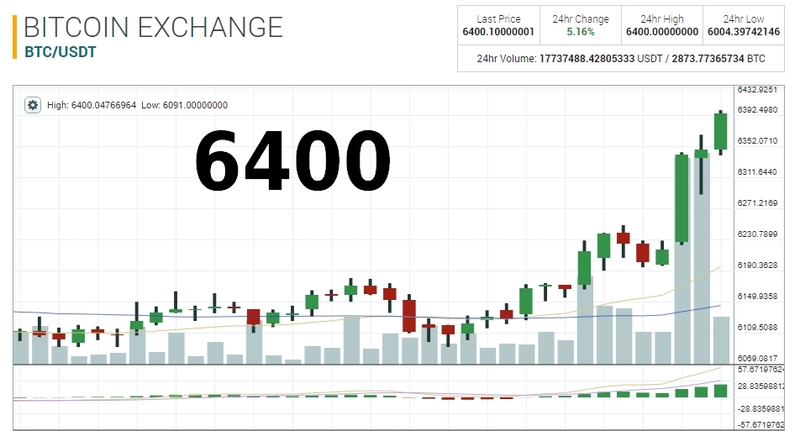 Five hours before Bitcoin / Bitcoin Cash Fork, Monero XMR jumps up in price! 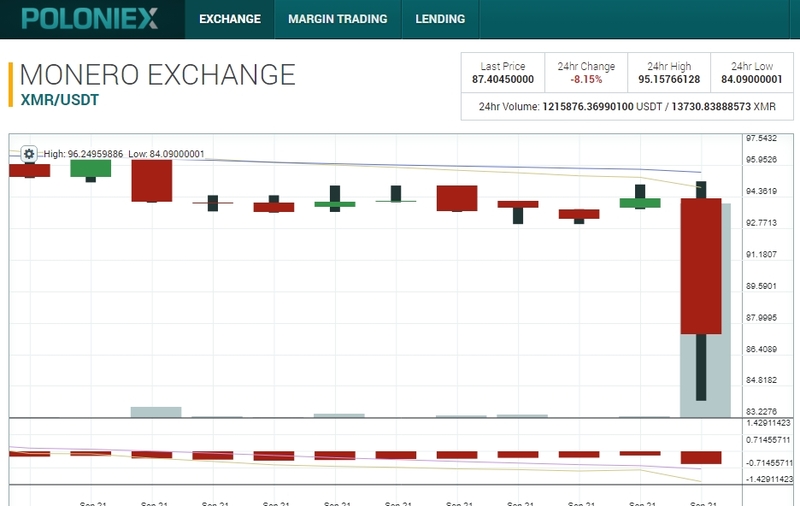 Well look at that Poloniex United States Dollar Tether green candlestick. If you are not familiar with candlesticks on charts, green means the price ended higher than before, red signifies a drop in price. Both candlestick and wicks display the “spread” of price jumps. Usually a big spread comes from a healthy exchange of buyers and sellers. This can also be referred to as a “rally” or “bull market” as the price is climbing upwards to what I feel will land around $44 USDT. The proof is in the pudding as the saying goes. Monero XMR has maintained a support level of $40 USD through the last muddy weeks of bitcoin and bitcoin cash havoc. Buy Monero and sleep in on August 1st, 2017! 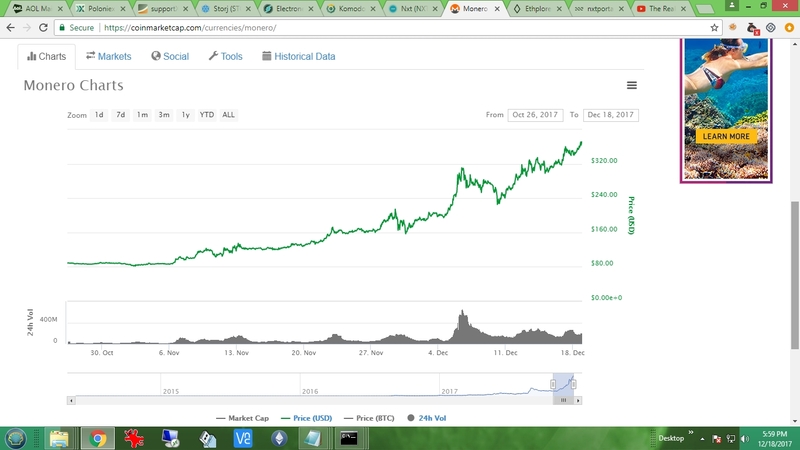 BTC fork on August 1st, 2017 is causing concern in prices, BULLISH LATELY? Anyone invested saw a loss of 25- 33 % over the last two weeks. WHAT IS IT CAUSED BY? FUD? SEGWIT? AUG 1, 2017? TWO BITCOINS? Would you notice also that hashrates keep constant or rising and not one serious investor is blinking an eye. In fact, they are buying back in, doubling-down, and sequentially placing funds into loan investments for interest returns. Yes, if you have $8 or $9 thousand to spend, put $5 in BTC and $3 or $4 K in XMR and by Christmas your investment could pay for your trip to the Bahamas with open bar. 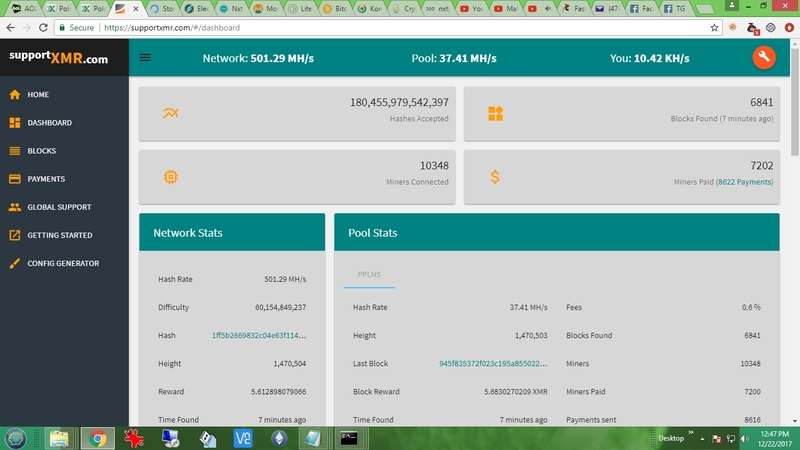 Keeping my rig active on XMRPOOL.NET to keep a steady income on XMR. About $4 a day! They have a pool fee of 0.6%. 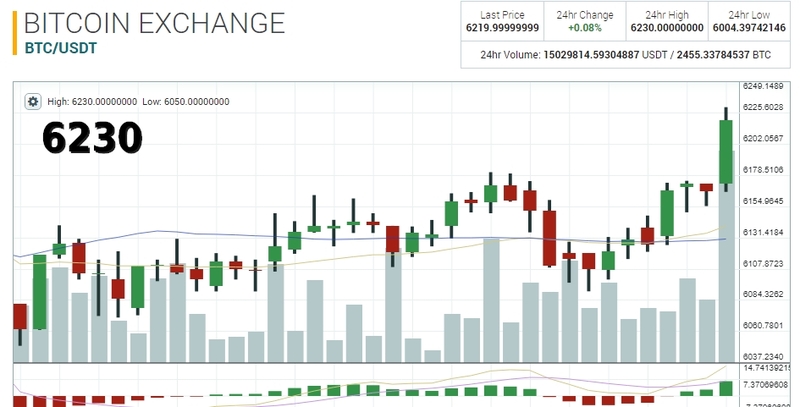 Monero XMR keeps support level at $44 USD, for now at least. Monero XMR is keeping its price around $44 USD amid highs and lows for the first week of July 2017. 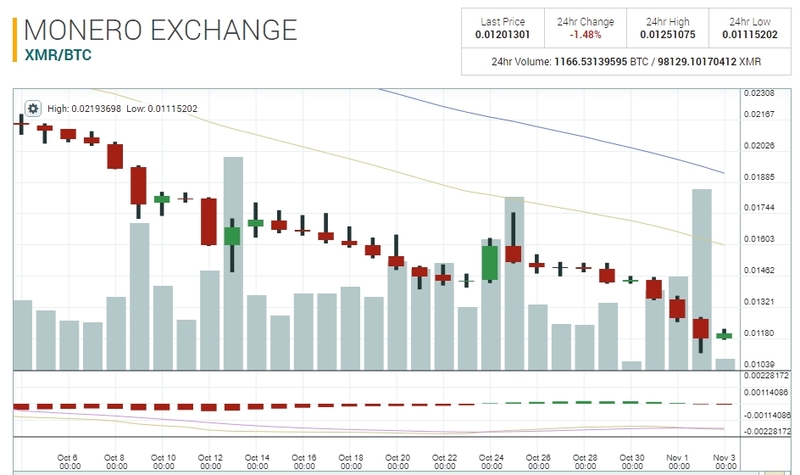 All coins seem to be on a downtrend today losing approximately 10% of their worth overnight. Many more “efforts” are underway inside the Monero network as the hash rate is over 120 MH per second causing the difficulty to rise above 14 billion for a moment. Graphic cards (GPUs) are being bought left and right to keep adding “efforts” to the network hashrate. The start of Summer 2017 brought a drop in price for Monero XMR from $51 to $44 USD. 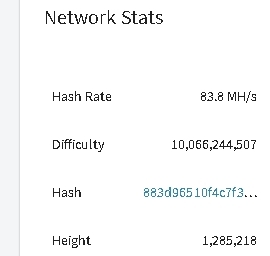 Network hashrate rose to over 90 MH per second, with a difficulty over 11 billion. This is about a 15% rise from last month’s average. Difficulty factor and hashrate power go hand-and-hand since the network is attempting to moderate coin distributions to an average of every 2 to 2.5 minutes. The more hashrate power, the faster the block rewards will be found. Hence, if the current difficulty remains the same the distribution of coins will drop to below an average of every two minutes. The network automatically (dynamically) adjusts the difficulty target to keep an average of every two minutes a block-reward is found. I am hoping for a $75 Monero XMR before the start of winter 2017. We’ll see! Monero Eric explains his reasons for solo-mining. Not for the money, but for the bragging rights of being part of Monero’s early history. Great write up. Bitcoin at all time high and no stop in sight as rain drenches the Southeast US. 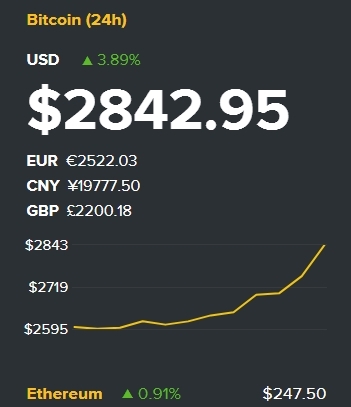 $2842 USD. Bitcoin won’t stop until it hits $3003, then it will stop and go back down to $2452.89, then go back up to $2570.32, then go back down to $2508.48, before going right back up to $3003.25. Now that is a tricky prediction but it could be better or worse. Some observers to the investment cycle just like to watch the sell order walls get eaten up by new money. Old money is holding tight or has already lost its private keys. New money means new tokens and new platforms and new ideas and new jobs and careers in the Information Technology sector. Blockchains lead to sidechains, soon we may have babychains. What would a babychain do? Maybe it babysits your money while offering it up to the highest bidder on loan interest? That would be nice, a decentralized loan brokerage clearinghouse which utilizes babychain technology to harbor your precious coins in an effort to build value by the collection of interest fees from short-term loans. Got all that? Great, get to work! Then you can offer your platform’s token on an ICO (Initial Coin Offereing), hosted on the ethereum network. See how it all is coming together? I think OpenBazaar.org is a great platform for an online marketplace that is centered on cryptocurrency and decentralization, plus its open-sourced. All coins up after the recent drop. BTC holds $2500, XMR holds $45, ETH goes to $242 USD. Watch as June arrives and keeps investors interested in recent trends to cryptocurrency communities and keeps all coins, Monero included, on the up and up. Investors are holding for long term and also investing in exchange lending services where they “create” temporary loans with coins they own at interest rates they decide at for a minimum term of two-day loans. The “Web 3.0″ is getting excitement as Ethereum scales Initial Coin Offerings, ICOs, to the masses. As a wide-open investor I decided to jump on the ICO bandwagon and bought a few of the new STORJ token. STORJ is a coin that was previously referred to as Storjcoin X (SJCX) and had an ICO in May 2017 for the new STORJ coin at $0.50 USD each. The reason for the name change was mainly because they are switching blockchains from bitcoin to ethereum. Main effect being lower transaction rates. Soon owners of SJCX will be able to transfer their coin to STORJ on a 1:1 basis. Essentially killing off one coin to join another, a hard fork if you will. A hard plate more like it as it will essentially be on ethereum’s network as a “token”. This may be what is exactly raising ethereum ETH prices upwards of $240+. They are now the “gatekeepers” of other cryptocurrencies. Imagine ethereum as a “game room arcade” with different amusements to play and interact with. Some involved physical interaction like throwing or kicking a ball. Other were games of chance as you would hit a button to respond to a visual marker. And still others were plain ol’ video games like Pac-Man. And just for fun let’s include the “claw machine” which allows you to grab for prizes. Now each amusement game will accept a “token” for you to play it, some requiring more than one token to play, and ethereum as the “token broker” will be officiating who get paid and where depending on which amusement game is being played and how often. The Pac-Man game takes plain ol’ QuarterCoin at one each, the “claw” takes two BummerCoins, the basketball through the hoop takes three JeepersCoins, and the roll-ball-into-hoop game takes one HergeyballCoin. Coins require wallets and wallets require ethereum to act as the “gas” in getting coins from point to point and peer to peer, hence the need for ethereum and hence the price will rise as demand rises. Monero plays it cool, lays low, and keeps churning the numbers. The network hash rate is above 80 MH per secoind and open full nodes are averaging near 1000. And the price is around $45. All is good, for now. Monero holds to a $40 USD average, maintains growth. Personal VPS Monero XMR Full Node hits 25 GB data transfer in one day! The newest version of Monero Core daemon utilizes Ring CT for better privacy. Its extra data along with it and it has shown to hit a new high limit today, 25 GB! This means a total upload/download of data to a virtual private server (a “VPS” for short) with it running only a Monero full node. 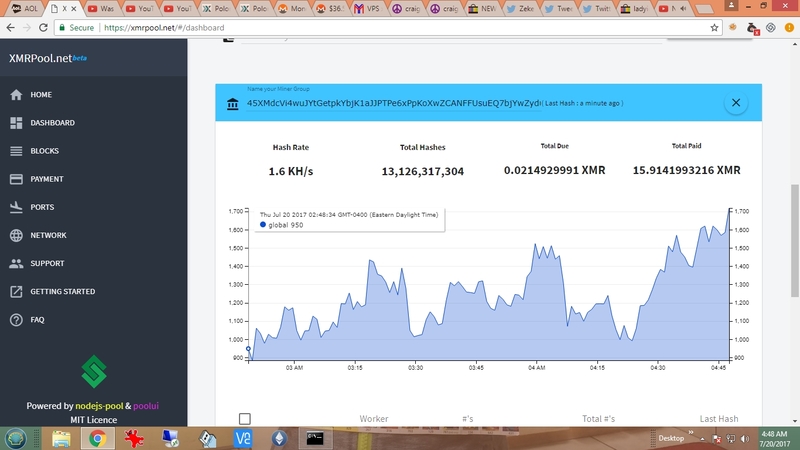 Currently the software and blockchain account for about 19 GB of data currently on the server, with more data being added every few minutes due to the additional blocks being discovered on the network. 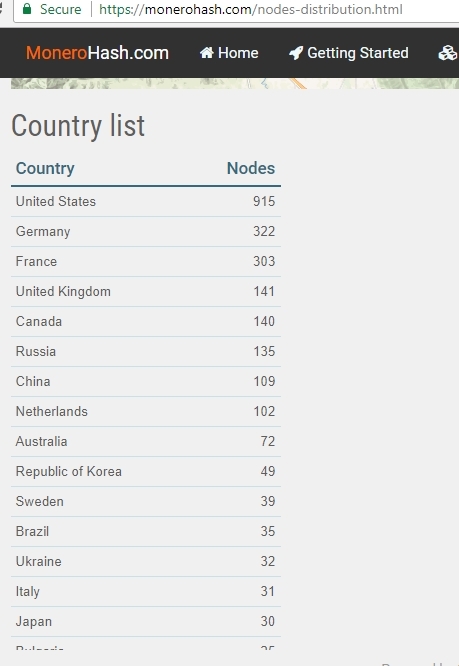 Recently I noticed that the worldwide count of Monero full nodes reached over 1,000. This is a great accomplishment for a coin which just recently turned 3 years old. IS ALL CRYPTO IN A BALLOON? This looks and smells like the dot-com bust of 2000. This is at the level of pets.com, the death of the altavista.net search page, AskJeeves, etc. OR, is society realizing that fiat currency is old news and cryptocurrency is the future. Seriously, lately Monero XMR hits $57 USD, bitcoin BTC hits $2800, ethereum ETH over $200. These prices are HIGHLY inflated and will show correction. 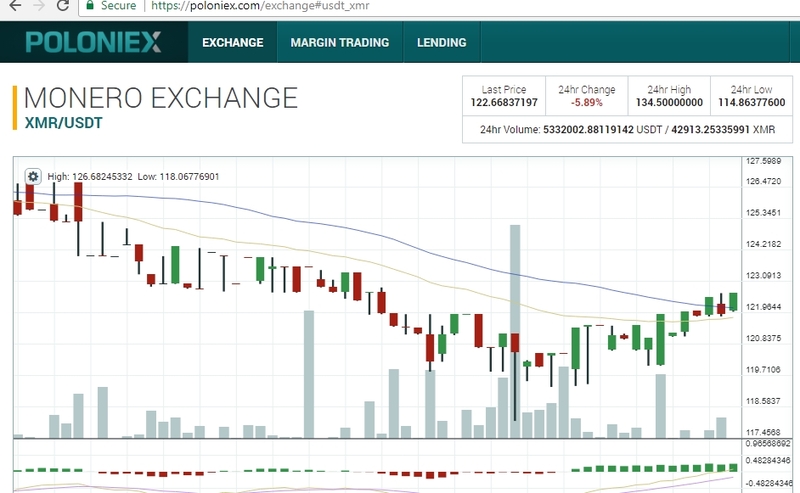 So, to see that today Monero XMR is trading around $43 AND its down for the day, that is great news! 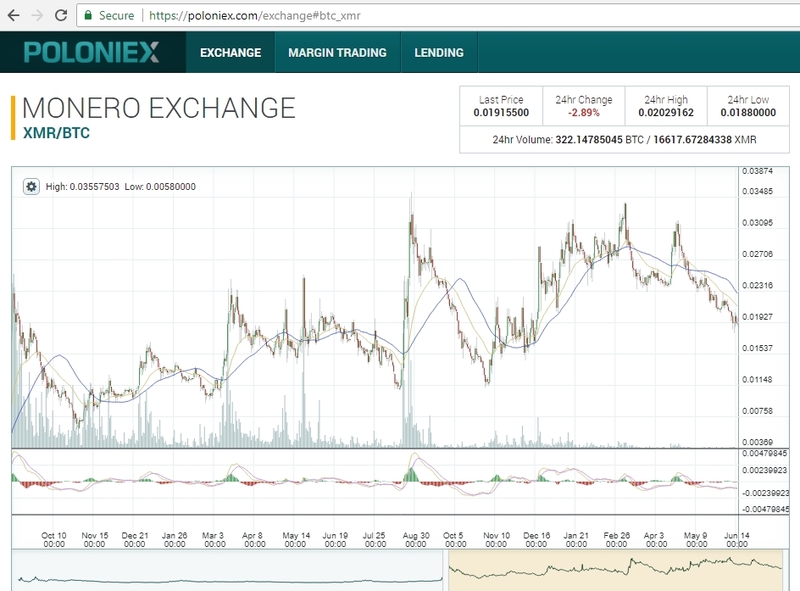 We know now that Monero XMR has a SUPPORT level at or around $38. This is great! Since price stabilization is needed to show the overall strength of any given coin. I do see Monero reaching $85 or more by end of year, but would rather see that prediction turn out slowly not quickly. Great guide on CPU mining! Great resource at this mining pool on how to use your CPU to mine Monero. 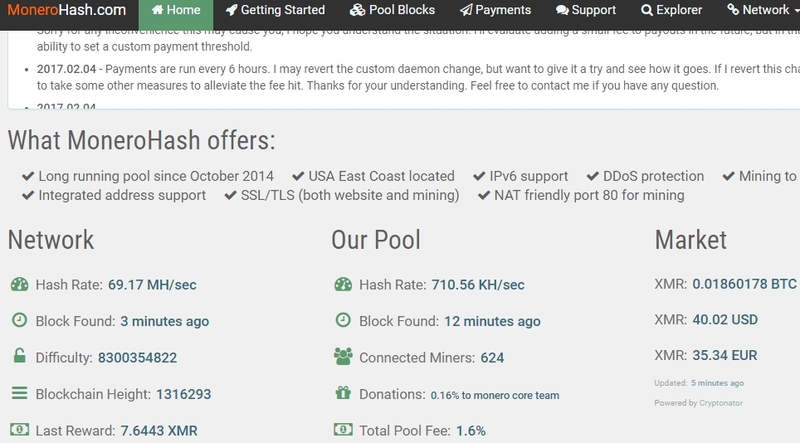 This pool may be a better value for your mining efforts as they only charge a fee of half of one percent, 0.5%. Bitcoin is so 2008….don’t be late. Who can stop the bitcoin train? Maybe Monero? Maybe Ethereum? Ripple? Who cares, let’s enjoy the bitcoin rocketship to the moon! Fixed and patched inside of the Monero network, but still vulnerable on other crypto-note coins. Please read to be informed of what bug was found. 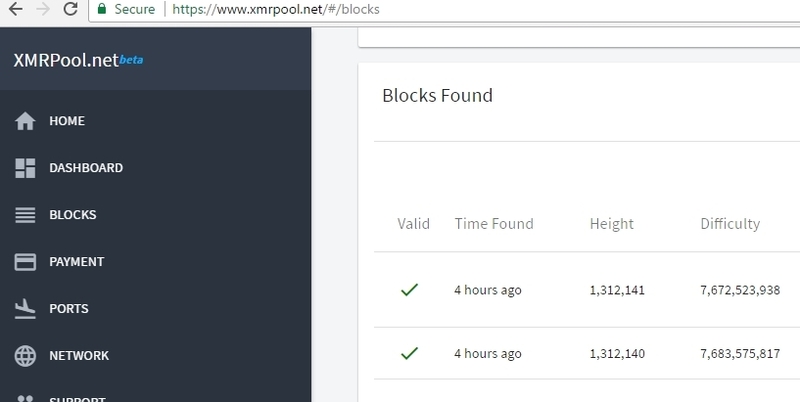 PPLNS Pool xmrpool.net gets consecutive block rewards! Very rare to see this, finding two blocks in a row. This is because the odds of a pool finding a block are determined by dividing the pool hash rate by the overall network hasrate. 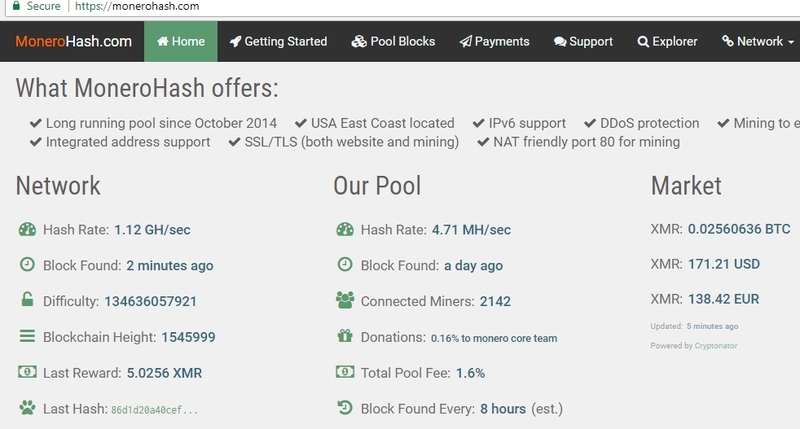 I notice a usual pool hash rate of 0.1 MH/second. And the overall network hashrate is around 65 MH/second, this ratio is 1 to 650. We have a 1 in 650 chance each time a Monero XMR block is found, so to hit twice in a row you multiply each chance occurrence odds by each chance occurrence odds, or (1/650 x 1/650 = 1/422500), or 0.00024 % chance of occurring. So, get mining so that you too can enjoy the benefits of earning Monero XMR coins. 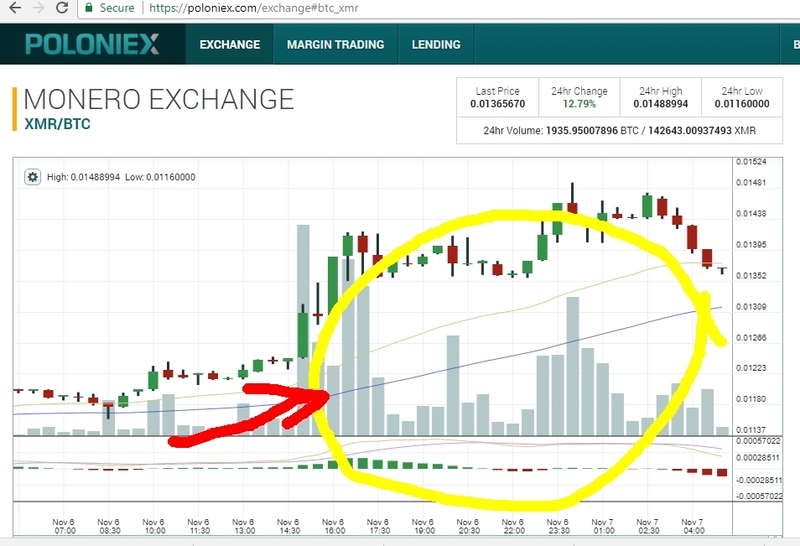 Recently crypto-traders on the exchange Poloniex (poloniex.com) have grumbled and vented about delays and lags in overall site performance, i.e. loading charts, resetting buy orders, etc. So Poloniex did what any good company does, release a statement to the general public explaining its recent spurt in growth and its efforts to keep up with demand. Is cryptocurrency FAKE Money? Watch this video. Spoiler alert; the market will decide. Bitcoin hits $1866.99 USD WHAT?! – Are prices due to delays in transactions? 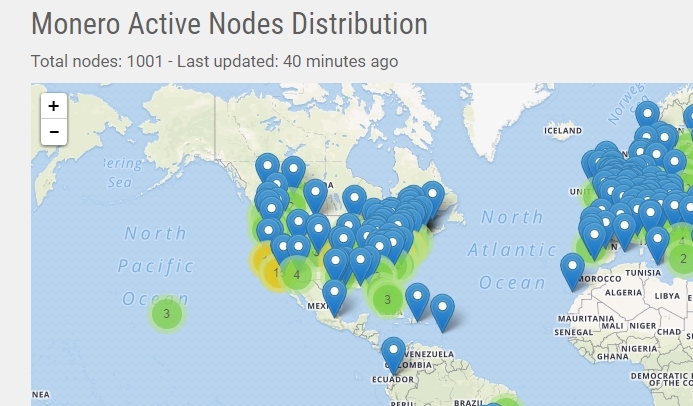 What is going on with the bitcoin network? I have noticed more and more delays in payments. With people’s transactions stuck in mempool limbo the price on the very active and alive exchange keeps raising the price. The reason the price is going up is simply because there is not enough “fluid” bitcoin to be passed around. This “fluid” bitcoin is what refills daily bitcoin users wallets and keeps their businesses running. They are buying X amount of USD in bitcoin no matter what the daily ticker price says. So if the price is $1500, $1600, even $1866.99, then they are going to buy. Then they are going to wait because the network is at its peak of transactions and the blockchain limit on block is still 1 MB. Those transactions not lucky enough to be included in that 1 MB will be stuck in the mempool awaiting their transaction to be among the other transactions on the next block which could take up to one hour! The price goes up. The price goes down. What matters is that the network is healthy and active. Fungibility and anonymity keep Monero XMR coin on top of the tips of tongues. 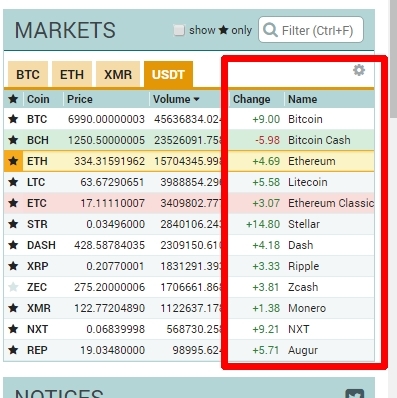 Any search of “cryptocurrency marketcap” will show you the markets’ current activity in terms of price and volume. Some speculate that price “jumps” and “dumps” are projected in advance by certain groups or “players” in an attempt to create “good” trades against you or others. I believe in Monero’s future. I do trade, but I mostly trade for other altcoins such as Litecoin, Ripple, Ethereum, Storj, MAID, Bitshares, and others. This portfolio is more like a sampler platter you’d order before the main entree. I like to play around in fungibility markets and see how well coins trade against each other. 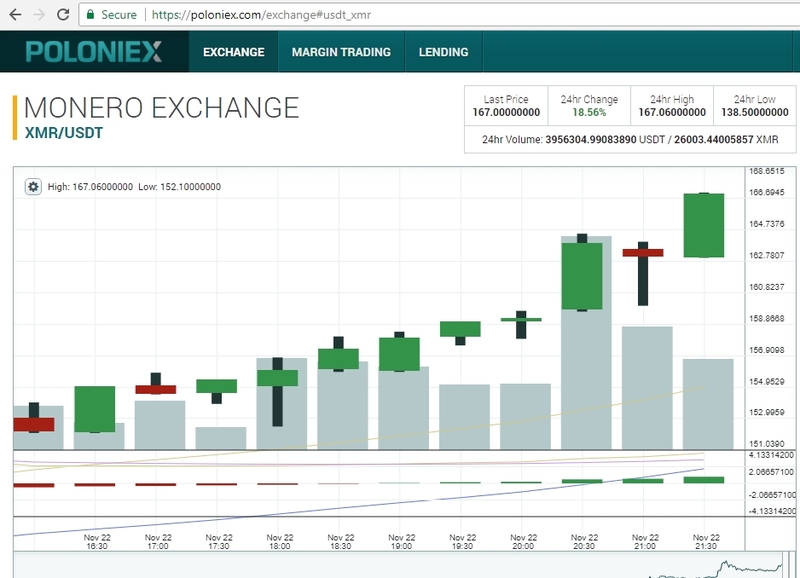 For example, on Poloniex you can trade XMR Monero against LTC Litecoin. Be the 1% in your pool. At www.xmrpool.net I am happy to be 1% of the collective. 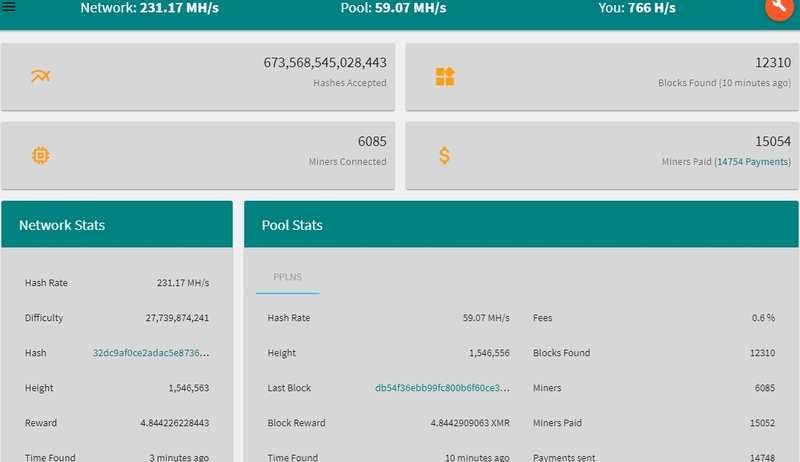 Some miners are in “solo” mode which means they receive all of the block rewards (minus pool fees) if their mining effort is the one that solved the new block. Current reward is about 8 XMR coins and are usually distributed about every 2 – 3 minutes. My efforts are from different consoles but I decided to put AMD graphics cards instead of NVIDIA. Recently I checked the software drivers and realized that they were not up to date. Keeping them at the latest release is important in making sure that your equipment is running at optimal levels. This website is the bee’s knees when it comes to all things Monero. I like to think of it as a SUPER HUB! Go check it out and be sure to bookmark it in your browser. You can also grab code to insert a Monero XMR price widget into your web content. 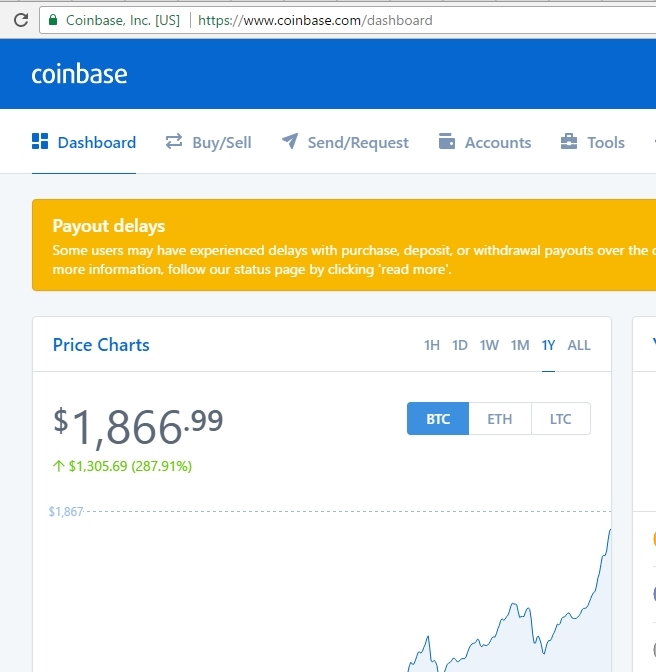 Get $10 in free bitcoin when you buy $100 after signing up on Coinbase! This would be great for newcomers to Monero. Simply sign-up, purchase then send your Bitcoin to an exchange like Poloniex or ShapeShift.io to convert to Monero. 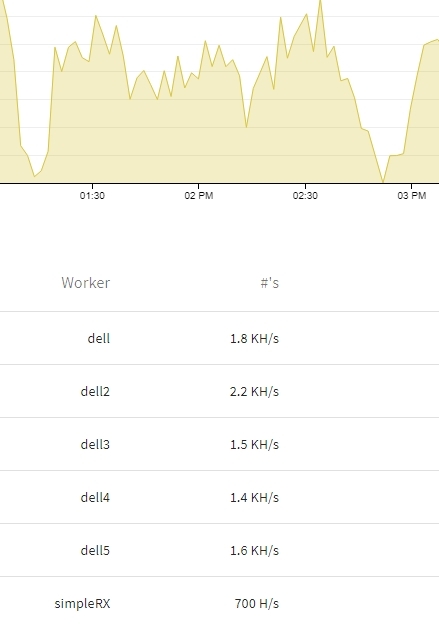 Full Node is on Full Tilt! 150 inbound connections?! 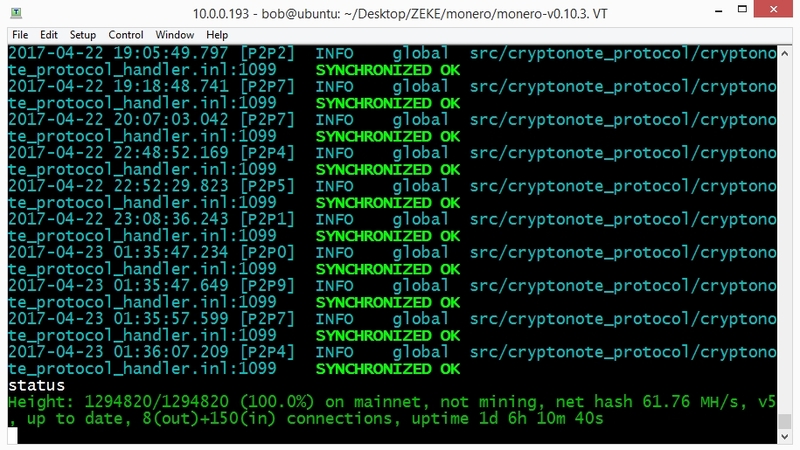 Looks like Monero miners and hobbyists alike are getting out their old laptops, Dell Dimensions, and Linux boxes and getting synced with the Monero blockchain. I personally run two separate nodes, one at home and one on a Virtual Private Server, or VPS. The VPS allows for tracking and detailed statistics such as how much data is being transferred daily, number of requests, etc. Lately the daily transfer both incoming and outgoing is around 11 GB/day. 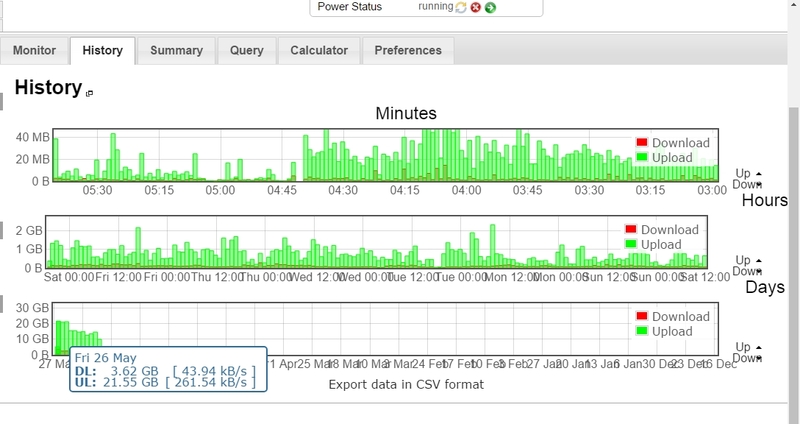 That breaks down to about 8 to 9 GB of outbound data (upload) and around 2 or 3 GB/day of inbound data (download). Today I was surprised to see 150 inbound connections to my home node. That is good sign that the network is alive and kicking! Monero (XMR) has turned 3 Years Old! Monero was born April 18, 2014 in a secret wine cellar by a hairy llama and red-haired stepchild from the suburbs. More myth and mystery than fiction. That’s what Monero is all about, anonymity when you need it! 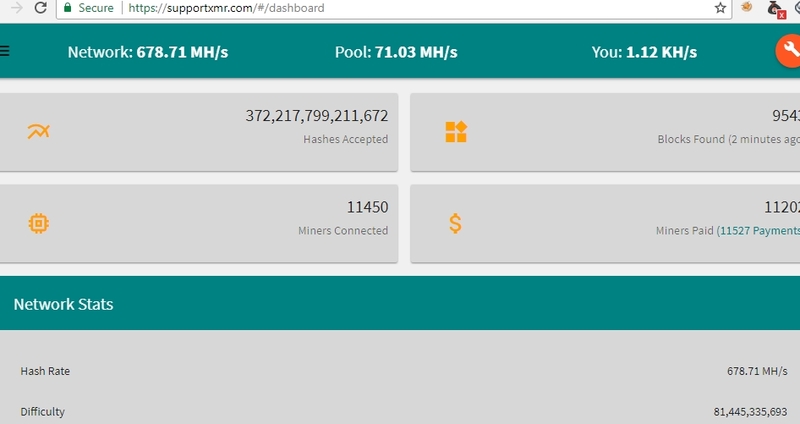 2017 Mining Effort Goal – 250 billion hashes at XMRPOOL.NET!!! I am setting a goal to hit 200 to 250 billion hashes in 2017!! I have a count of 2.5 billion already so 250 billion seems like a reasonable goal. All in an attempt to gain more coins and also keep the network running smoothly. I’ve incorporated the help of http://www.nicehash.com/ this service enables you to “rent” out mining efforts provided from both USA and Europe. You will need to setup an account, deposit Bitcoin, then post a Standard or Fixed mining effort job in the algorithm of your choice attending to the mining pool of your choice. 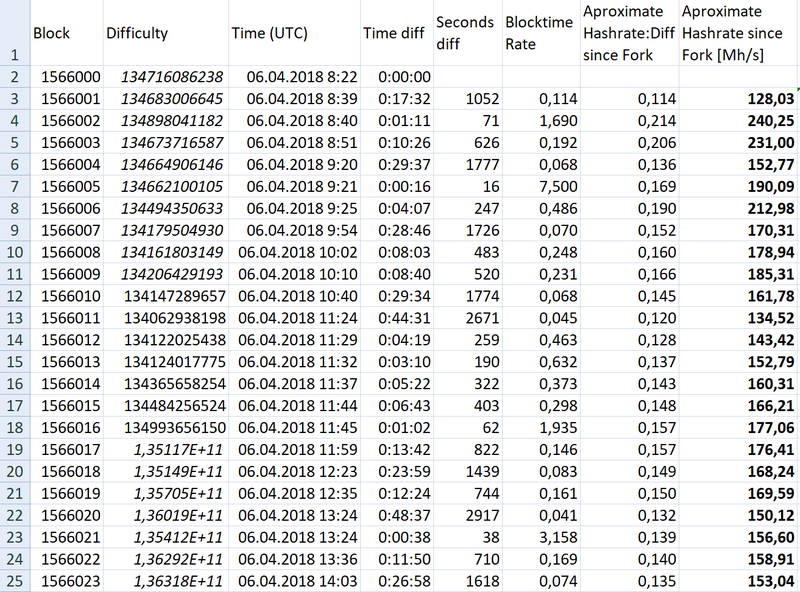 In this current effort, I submitted about 0.02 Bitcoin to NiceHash and received about 39 hours of mining effort hash power from both USA and Europe miners. It was an exciting endeavor to be able to “bid” on the lowest priced miner and still get a high hash rate return at the mining pool of my choice. 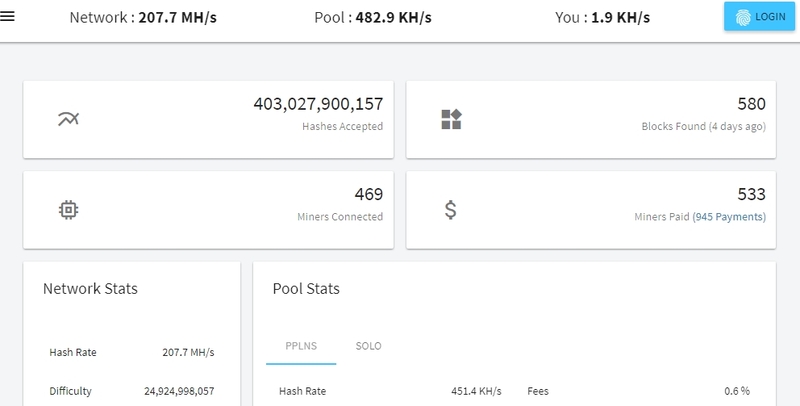 The nice thing about NiceHash.com is that is you place a “Standard” bid on hash power and if the price of mining hash power goes lower, then you are able to lower your bid every 10 minutes so that you can catch the best price per hash rate. One pool I have been mining on has raised its payout level without announcement. 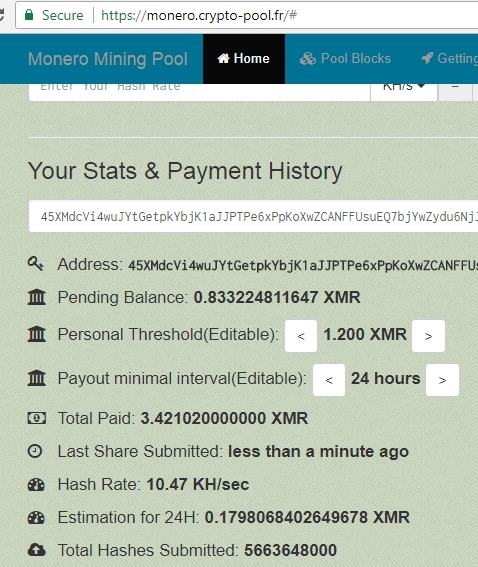 Mining pool www.moneropool.com now has a payout level of 0.5 or more XMR. Which is a bump up from 0.4, the previous minimum payout threshold. Its one of the best pools simply for the fact that it is very trustworthy and has been around from almost the beginning of Monero. This image speaks volumes of where we are today, April 9, 2017. Monero is getting ready for the next hard fork which will enable Ring CT transactions which will increase privacy of senders and receivers of XMR cryptocurrency. 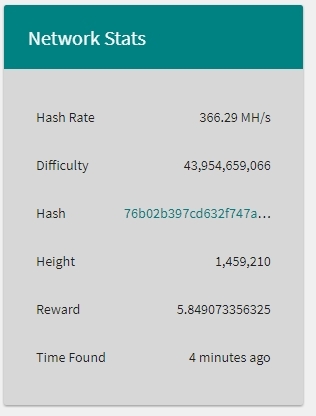 Hash rate up, difficulty up, reward down. 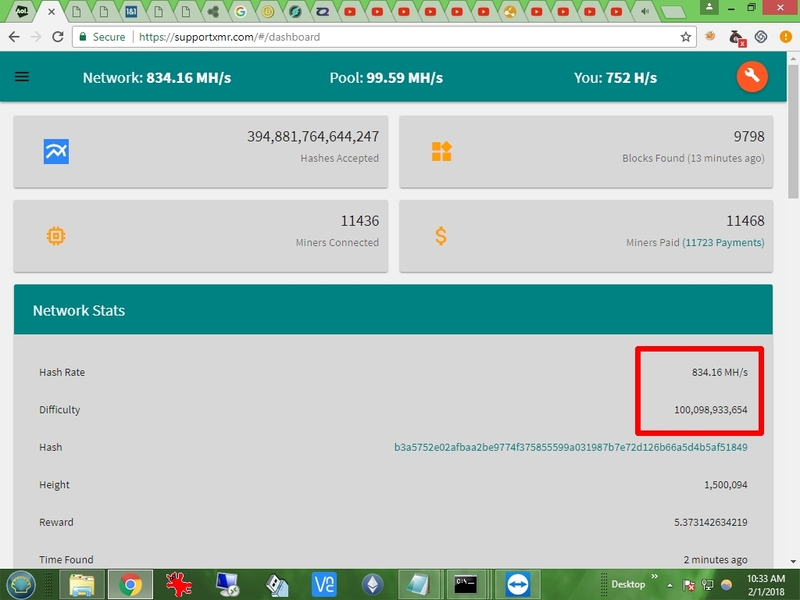 What does all this new mining interest mean? Are more people becoming aware of Monero’s potential? Are these new miners or veterans? Current market price is around $21.00. I can’t say for certain what the price will be in the future, but if you see a trend then follow it. 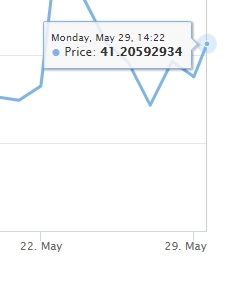 One year ago (2016) Monero was selling for about $3 and a year before that you could get them for around 60 cents each. Get mining today or buy some for a rainy day. They say, “Don’t put all your eggs in one basket!” Well here are all my eggs (mining efforts), some on pool mode and some on solo mode. The pool mode will draw a steady stream of Monero into my wallet address. The solo mode is just like playing the lottery, but if you hit you get the entire block reward, minus 0.4% fee. That equates to around $150 on today’s marketplace. 6 KH per second!! The eBay find of the week! This video is worth a watch. 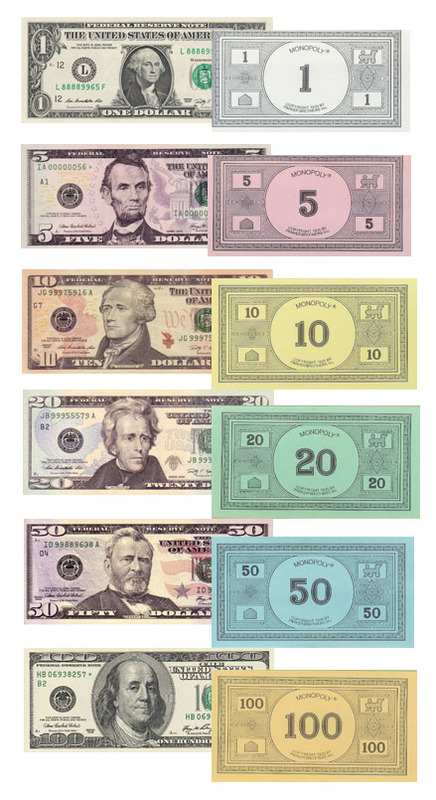 It explains how our current monetary system, i.e. Banks, uses the “loan” to create money that previously did not exist. It makes perfect sense. For example, if you wanted to borrow my shovel I would be more than happy to lend it to you. However, when you returned the shovel I would not expect an extra item with it. However, loan cycles create a slim-to-none money supply which keeps just enough circulation to pay current and past debts’ interests. An update to the daemon is now available. In these instances users with full nodes should update their version of the software on their web servers. This site currently runs a full node on a VPS, a virtual private server. This service is only $6 per month and it allows users to provide a stronger network. Today the software and blockchain make up approximately 15 GB of data. Each day the upload/download data transfer rate equals on average 12 GB total (usually about 2 GB download, 10 GB upload). This is because the daemon is being run with no limits on data transfer rates. If you decide to run a full node you can set upload/download limits on data The introduction of RingCT confirmations will be additional data added to transactions and thus add to the overall blockchain. Welcome to our first entry! We are MineMonero.com, a blog for XMR Monero coin cryptonote miners. Today’s price is $18.50 USD.